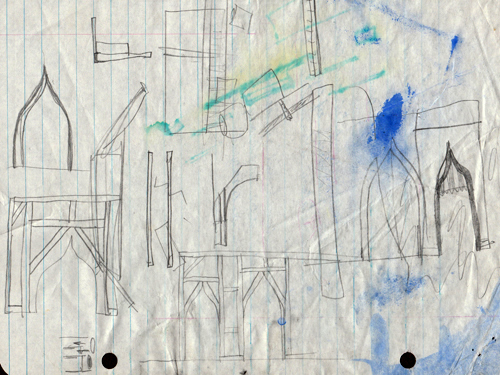 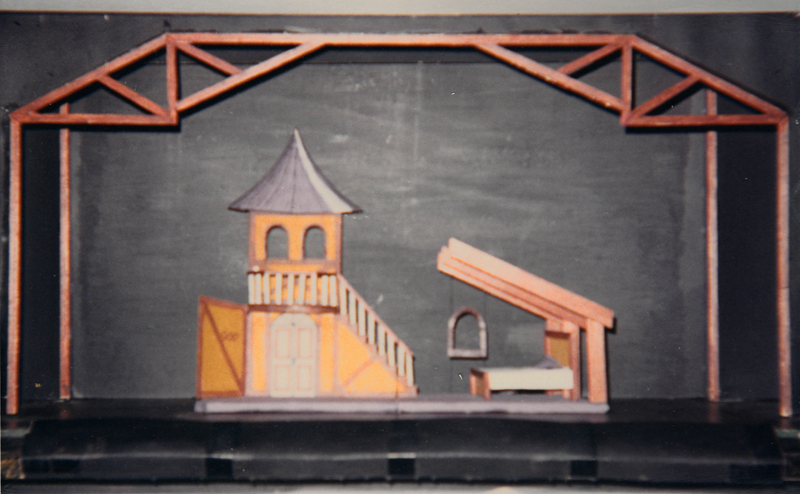 From the age of 8, I was fascinated with the design and construction of stage sets. 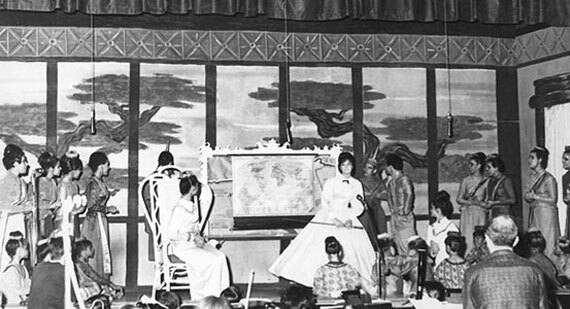 Theater transports its audience to a place within their minds that they might not ordinarily go. 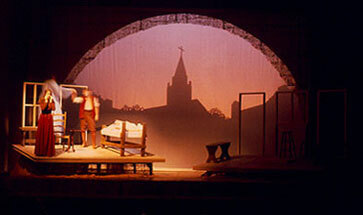 The set designer is able to create a fantasy environment on the stage. 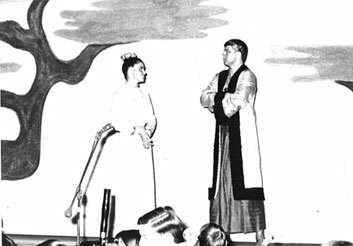 My parents were long supporters of the Dallas Summer Musicals. 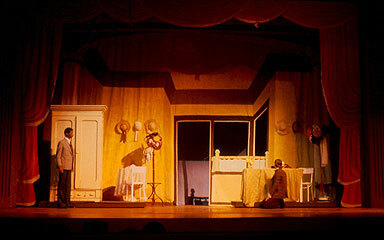 T. I would sometimes go with them - the first show I saw there was The Sound of Music.The shows were good, but I was mesmerized by the sets that painted the scenes and the mechanical ways of changing the scenery between scenes. 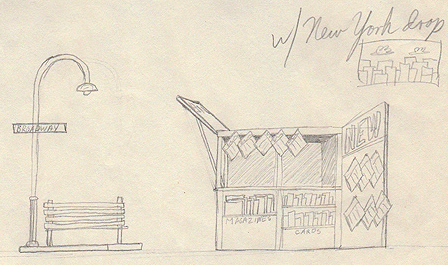 I wanted to do that. 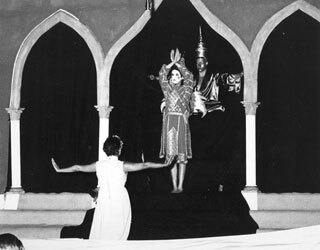 The first show I designed was for my mother's dance group of folklore dances from Mexico. 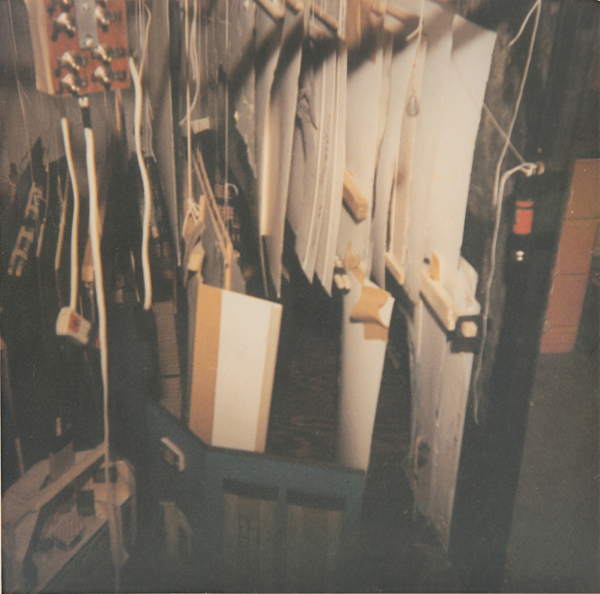 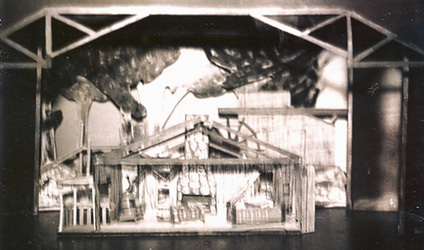 I became fascinated with model-making. 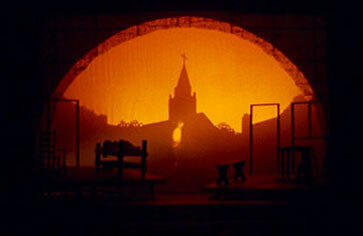 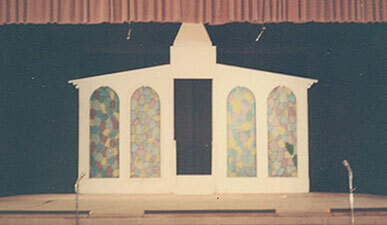 In high school, I designed the sets for the school plays and musicals and productions at our church. 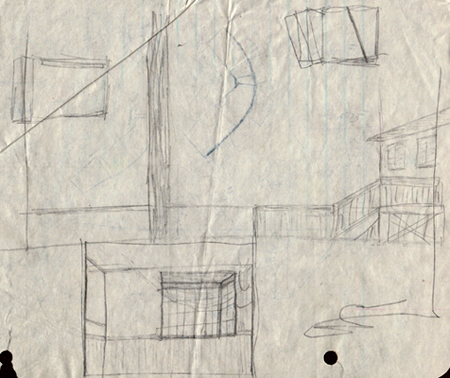 Even when I was a teenager, I was making connections, seeing possibilities, and noticing ways to make things better. 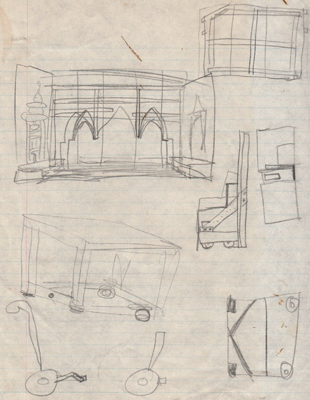 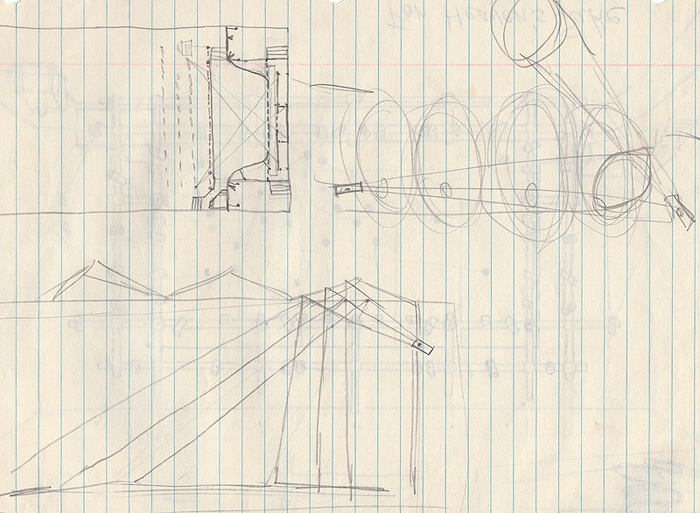 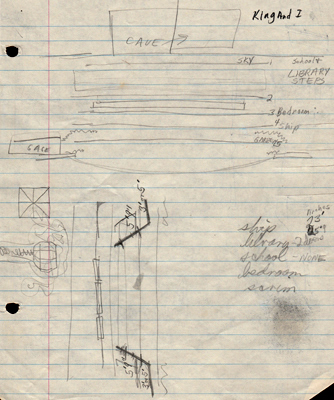 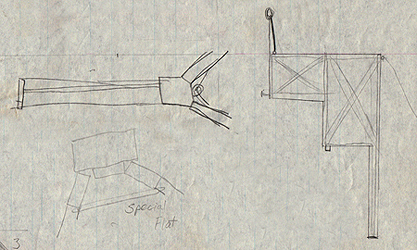 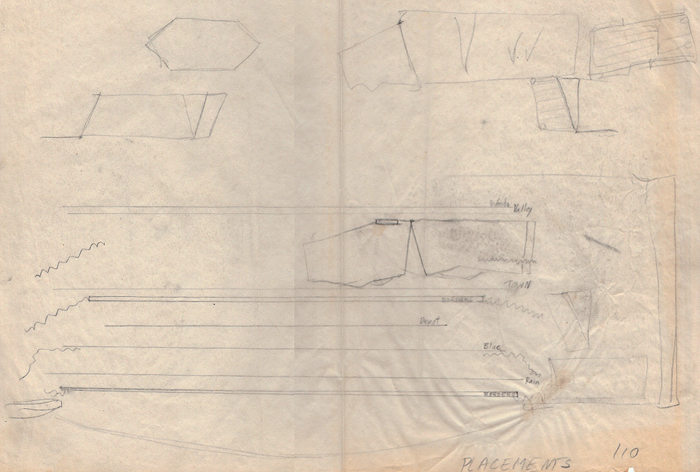 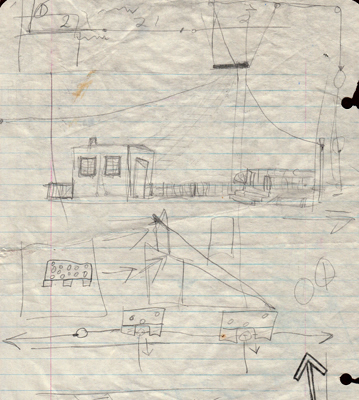 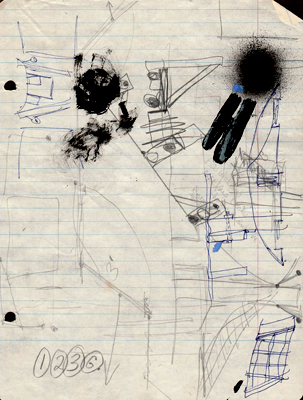 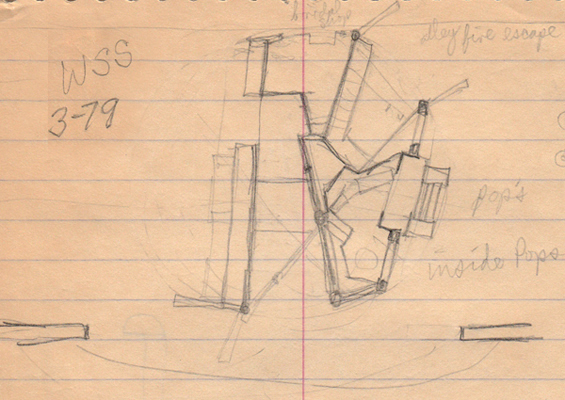 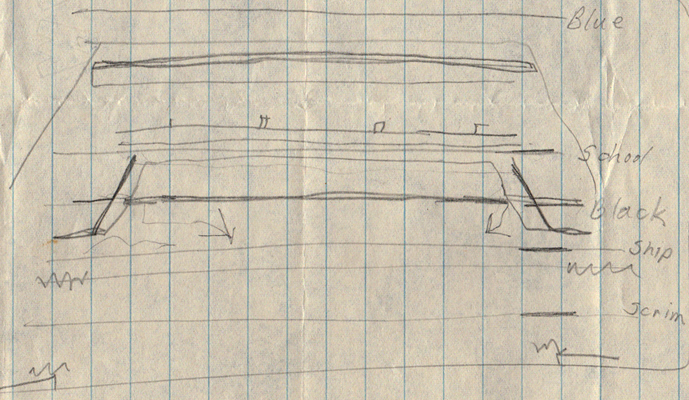 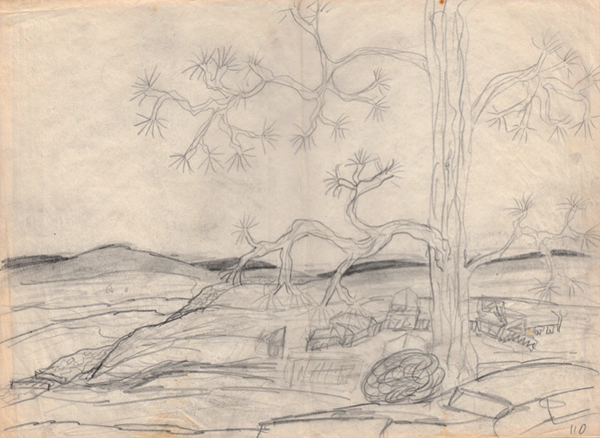 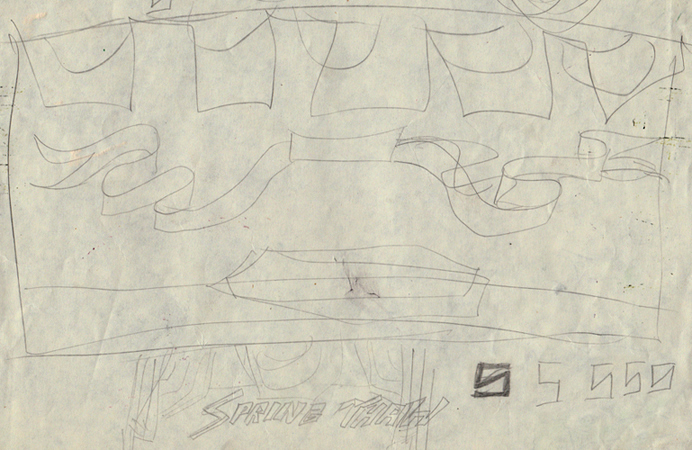 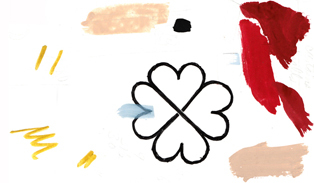 Below are a few ideas I developed and sketched from 1966-69. 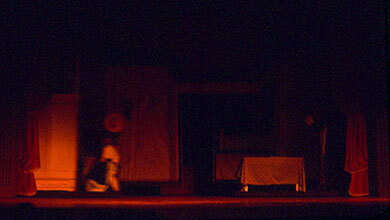 My mother created a dance group that specialized in folklore dances from various regions of Mexico. 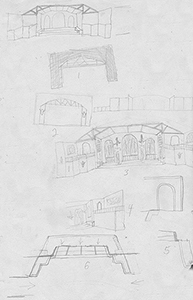 She asked me to design some simple stage sets that could easily travel as the group performed around Texas. 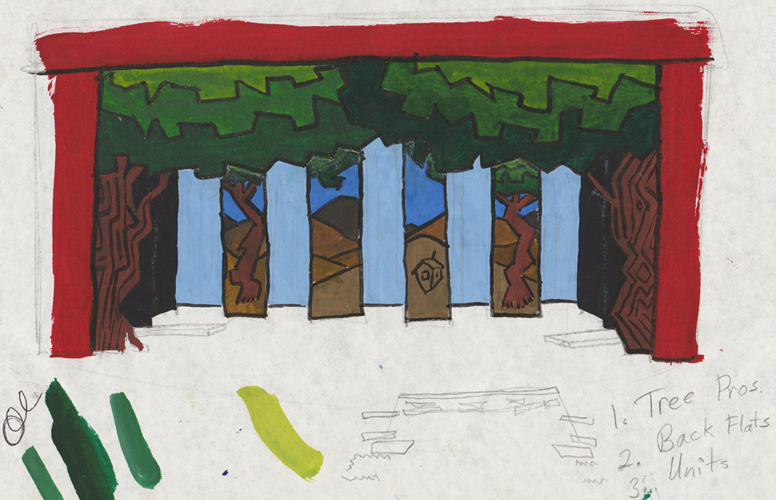 These included an Aztec ritual area, wing flats, a forest/jungle with trees, and cactus. 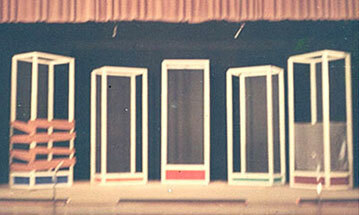 One number was an Aztec god dance. 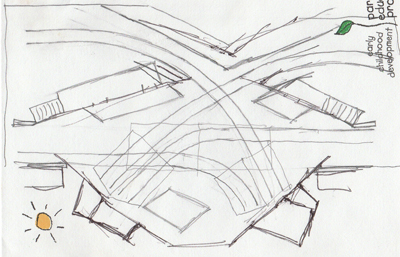 It needed a pyramid and a set of steps for the plumed god, Quetzalcoatl to ascend. 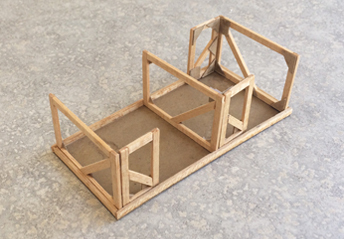 I built a canvas flat in the shape of a pyramid that folded in half to protect the canvas and to make it easier to transport. 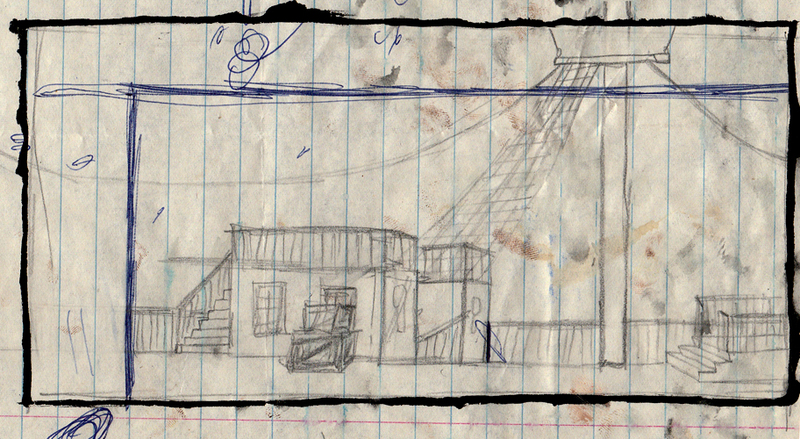 In front of that were three steps that I built out of scrap lumber. 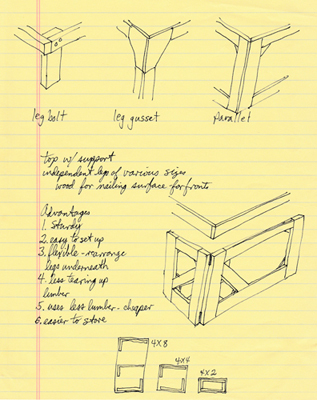 I was still learning about structural support and would add wood where necessary to support human weight. 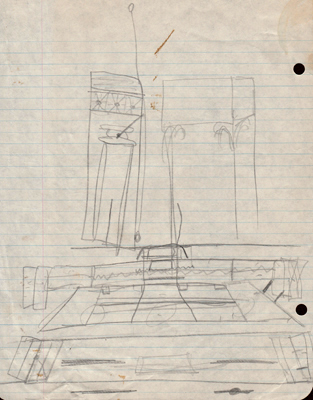 It didn't tour well and was cumbersome to cart around. 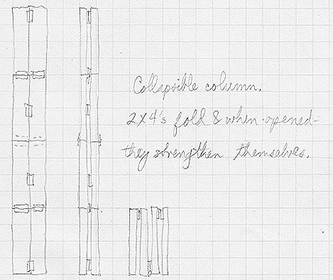 I designed a set of 3 steps that would nest inside of each other when inverted yet provide ample support when set up. 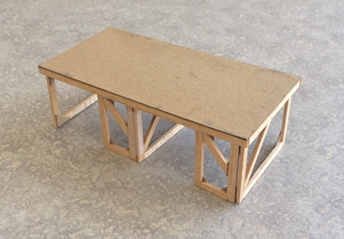 I built them out of 1x4 lumber and half inch plywood to keep the weight down for easy storing and carrying. 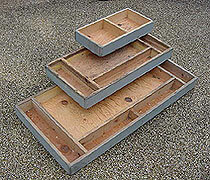 It worked - simple solution to a set of 3 steps that would be easy to transport. 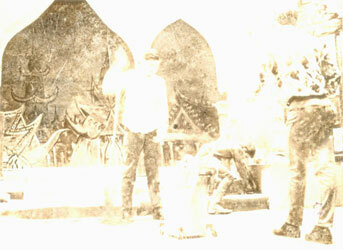 The pictures above were taken years later, after they had sat in the garage and weathered a bit. 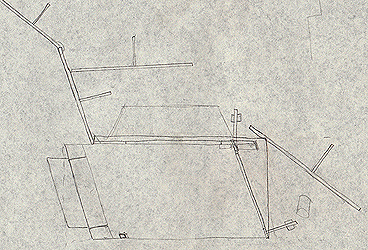 The standard way to attach flats (in 1968) was to use a loose-pin hinge. 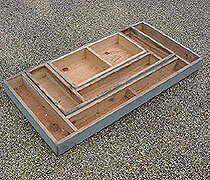 This allowed the pin to be removed easily so the two flats could be separated, moved, and stored. 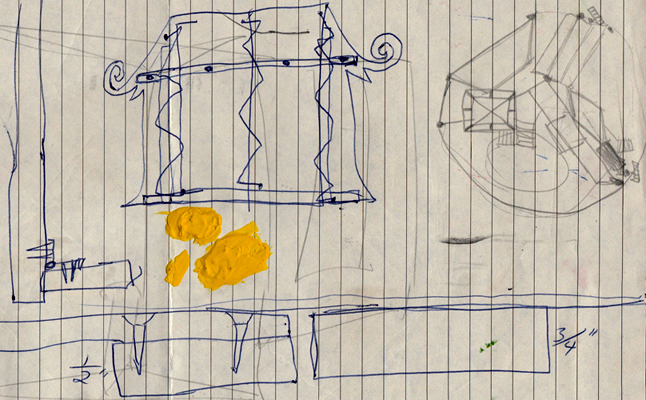 I wondered about using hard plastics, instead of metal, and a male-female pin arrangement that didn't rely on a separate pin. 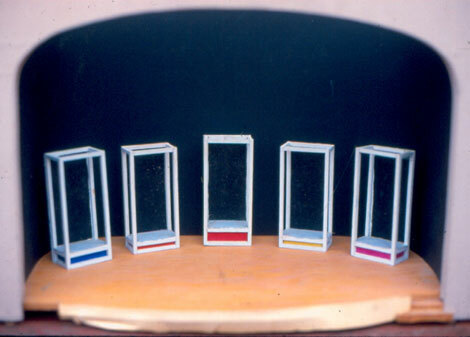 Plastic is more 'forgiving' and has a smooth surface for sliding in and out. 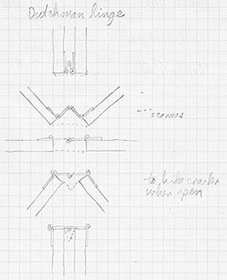 The tapered end of the male pin and the funnel opening of the females allowed easier operation in set up and strike. 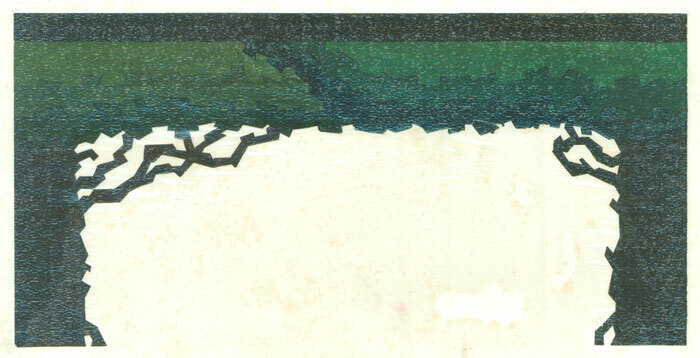 Canvas across the opening hides the crack between sections when open. 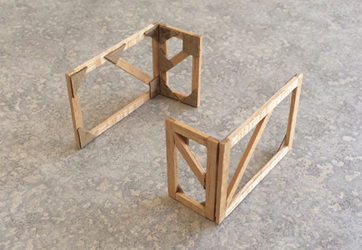 Wood lengths are supported with opposing hinges - when opened and folded over, form a rigid support. 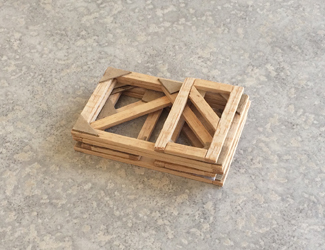 When hinged shut, collapse into a smaller package for moving and storage. 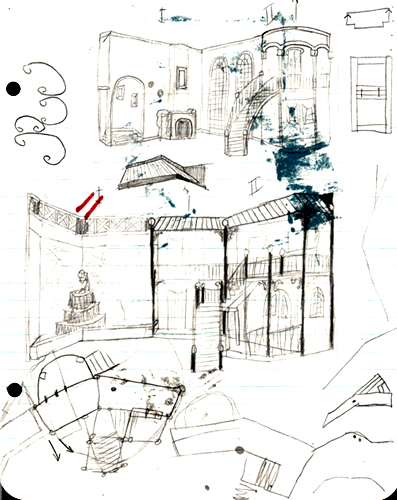 I wrote a simple storyline about gypsies and royalty and cross-class love. 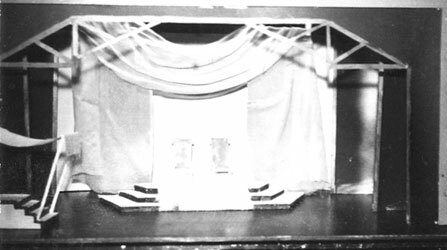 These are some of the set models I made when I was 15-16 years old in 1966. 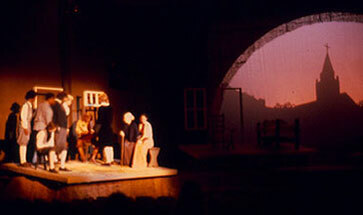 Opening scene at sunrise at the mill. 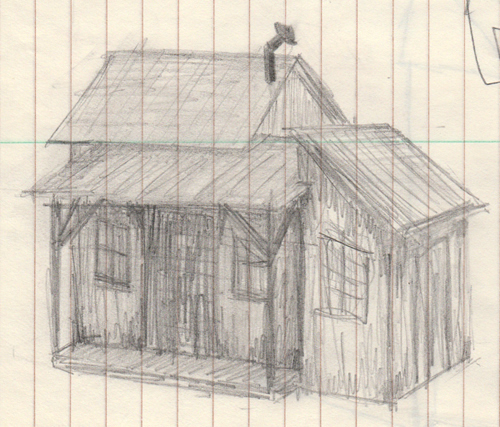 A cabin. 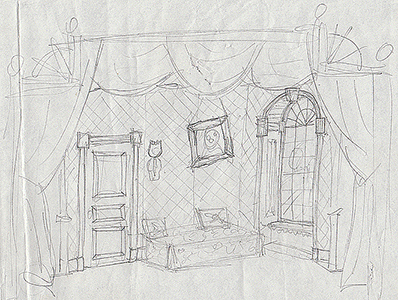 The Queen's bedroom. 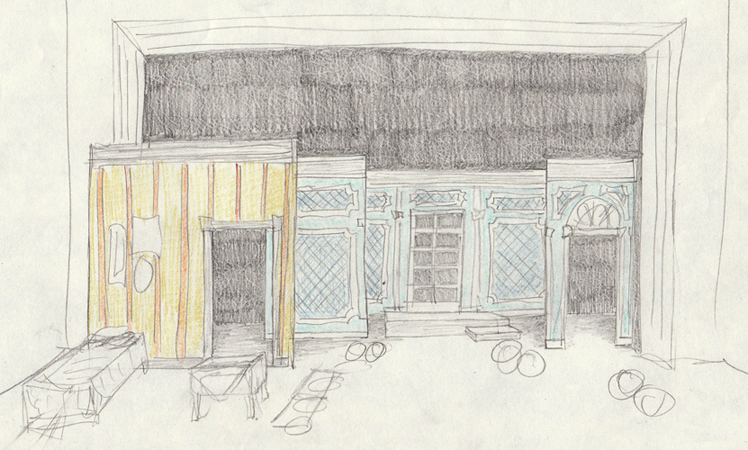 Two versions of the dining room. 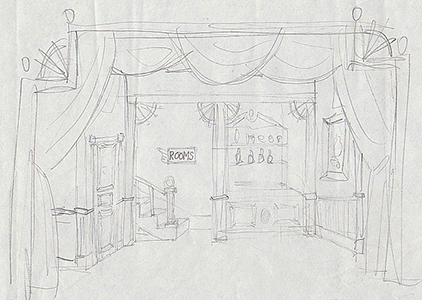 The stylized one wasn't consistent with the look of the show. 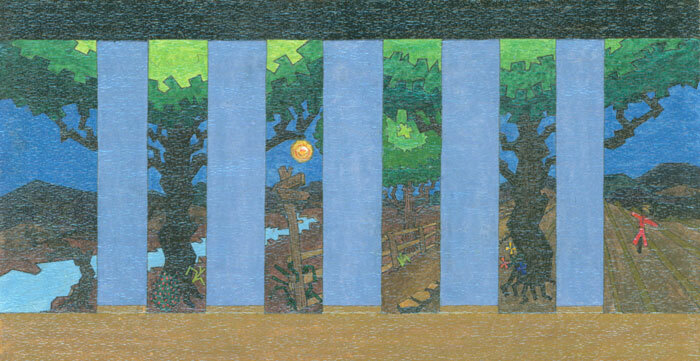 The courtyard. 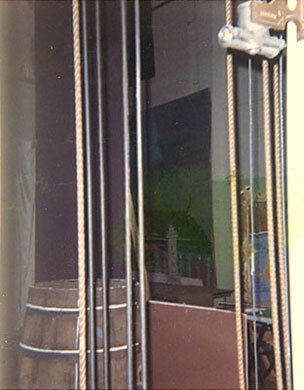 The wine cellar. 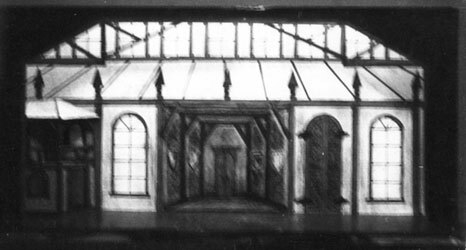 Outside the Great Hall. 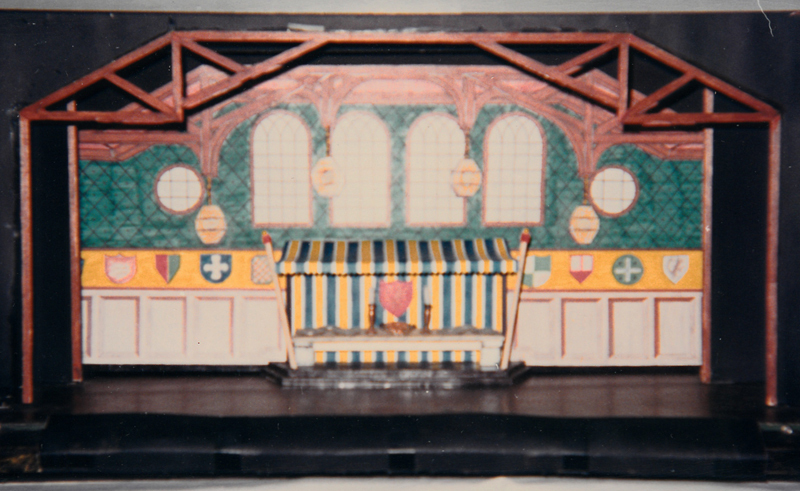 The Great Hall. 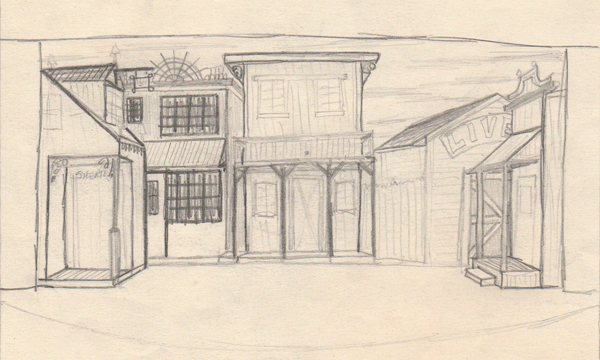 This story was about some stranger arriving in New Orleans and feeling smitten by a slave woman about to be sold - he buys her (WTF was I thinking? 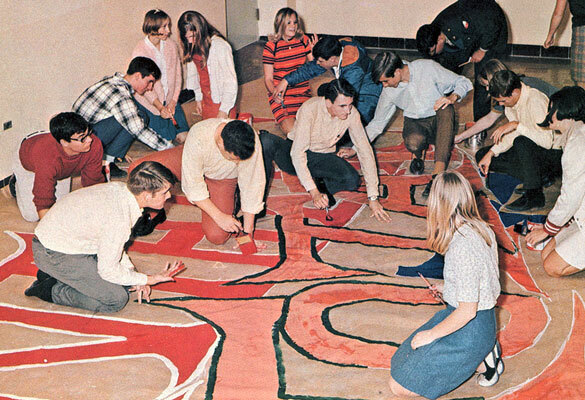 This was about 1966, but, still. 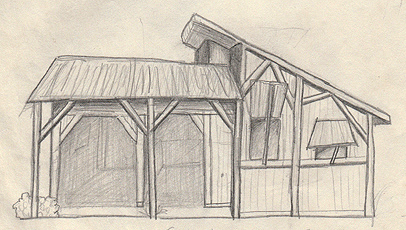 )It opened in a forest riverbank with a levee and a mill. 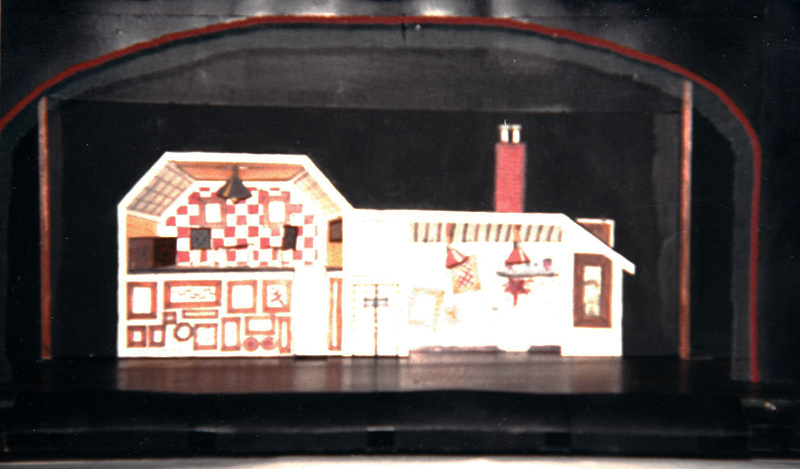 A paddleboat came across the back of the stage with people and cargo on board. 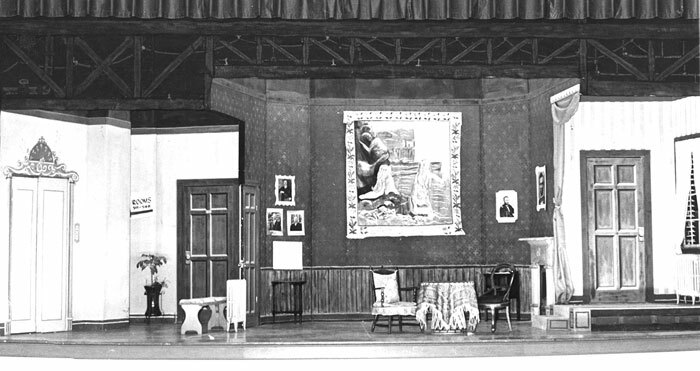 The living room. 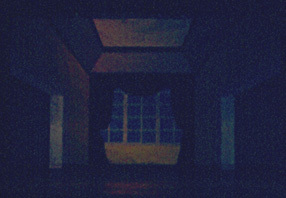 The courtyard of the home. 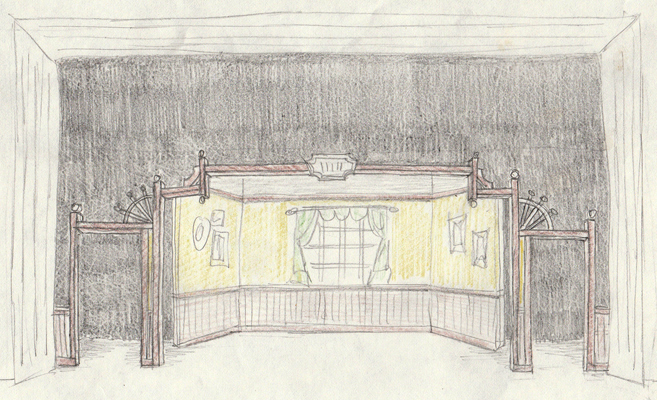 Sam's Restaurant with curtained booths. 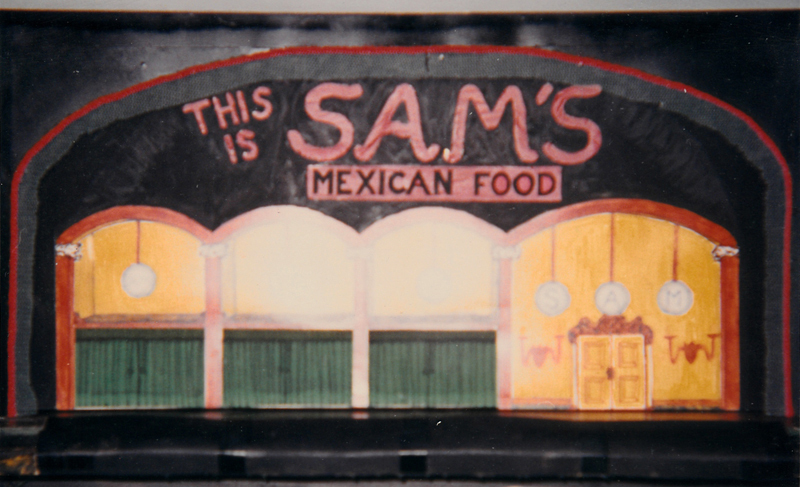 Pantry of Sam's. 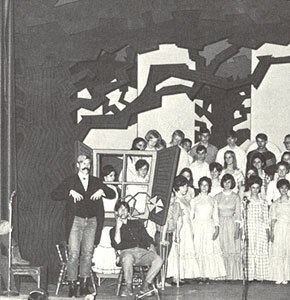 When I got to high school, I joined the Art Service Club since that group was responsible for the scenery for all school plays and pep rallies, and assemblies. 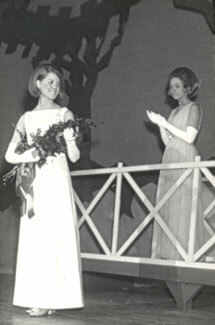 The faculty sponsor was Ms. Hudson who gave us leeway to work but kept an eye on us to guide us in the right direction. 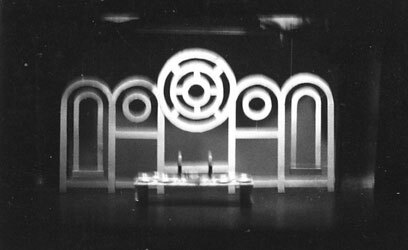 I became the lead set designer and worked with a crew that became my best friends: Laird McDonald, Barbara Smith, Becky Kennedy, Chris Chernoff, Abe Frishman, Allen Smoot, Ann Kilby (daughter of Jack who invented the transistor at Texas Instruments), and Joe Chapman. 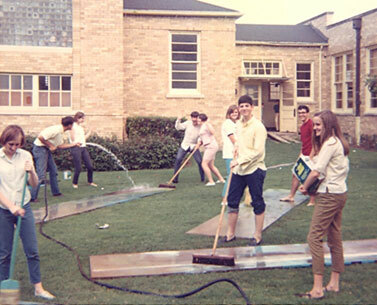 We would work during lunch periods and after school. 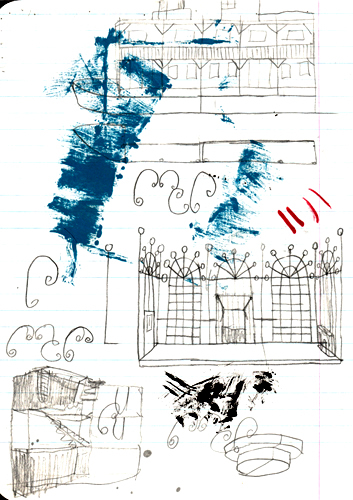 We had a great time, in and out of school. 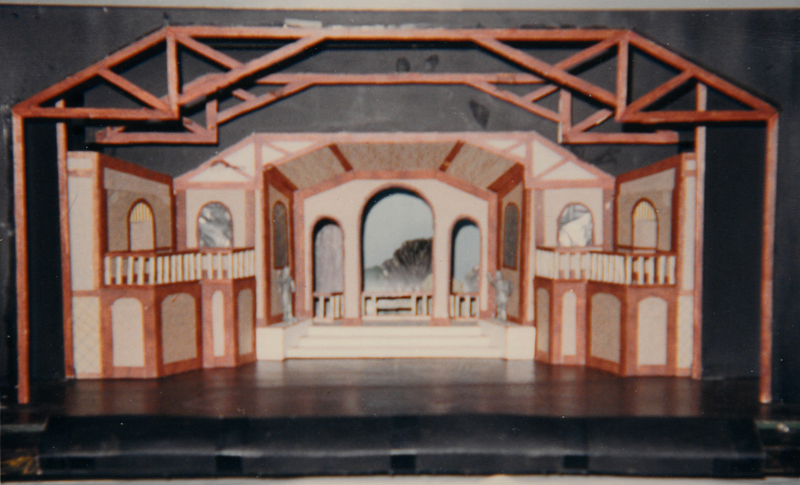 The experience encouraged me to major in set design at the University of Texas (although I switched majors after my freshman year). 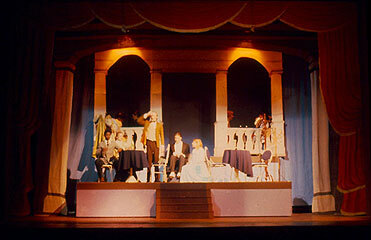 Below are some of the shows and productions we worked on. 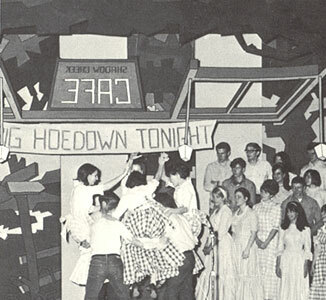 This Rogers and Hammerstein classic was the annual spring musical in 1967. 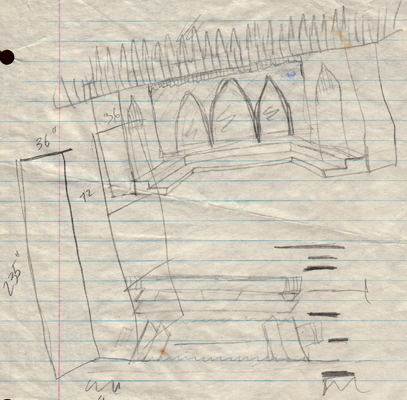 It was my first production to design - I spent many a late nite researching and sketching. 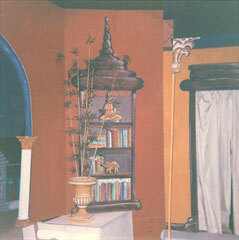 The only color photos I have. 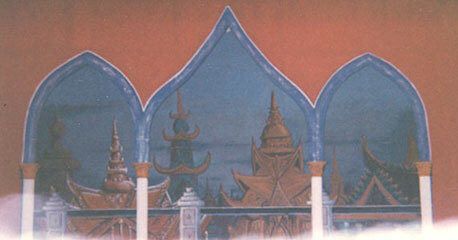 Real Musgrave designed and painted the backdrop of the Bangkok cityscape. 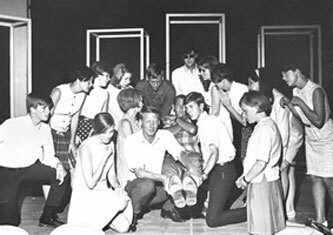 Me standing, the backside of Allen Smoot, and Lars Lundahl kneeling. 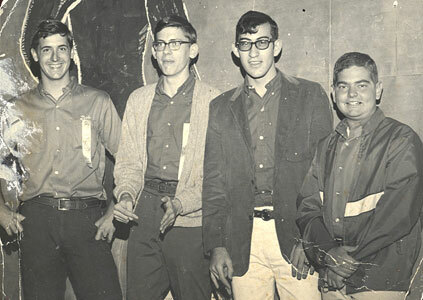 Some more crew: me, Bobby Rohloff, Abe Frishman, and John Bookhout. 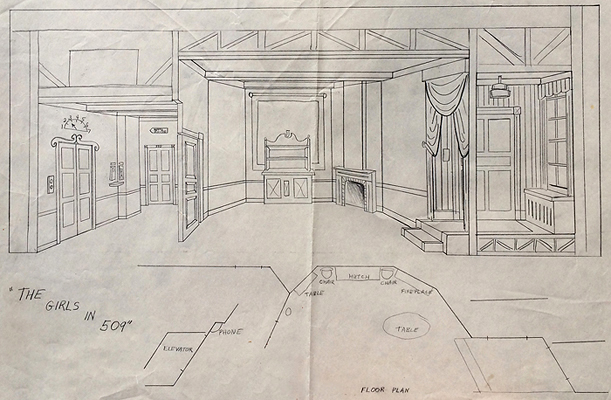 The inspiration for the King's Palace set may have come from Cinderella's Castle in Disneyland. 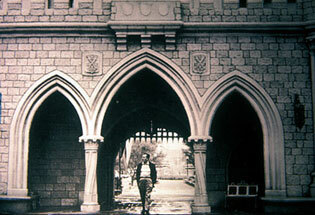 My family and I had visited Disneyland in 1956 and I suspect I had seen this classic foto of Walt walking through the arch the morning before the park opened for the first time in 1955. 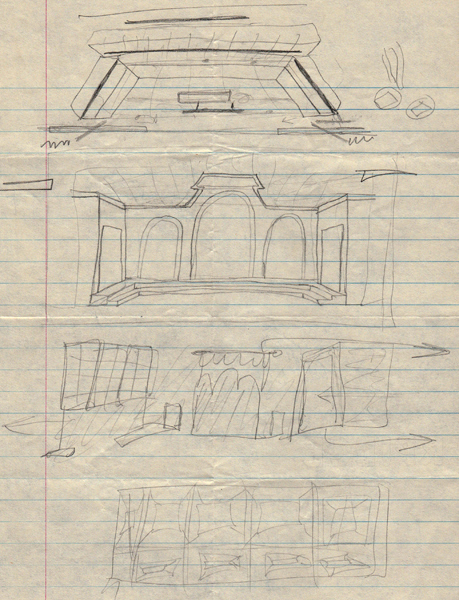 I don't think I consciously referenced it when designing the King and I sets, but it was probably seared in my brain somewhere. 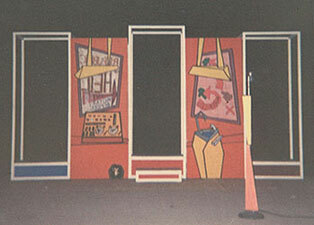 A comedy set in an old high-rise apartment building. 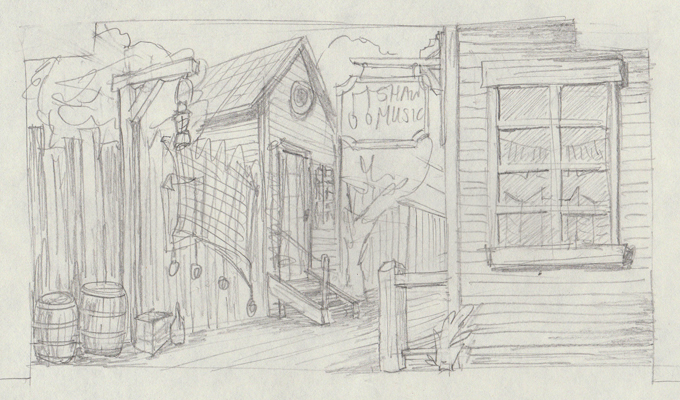 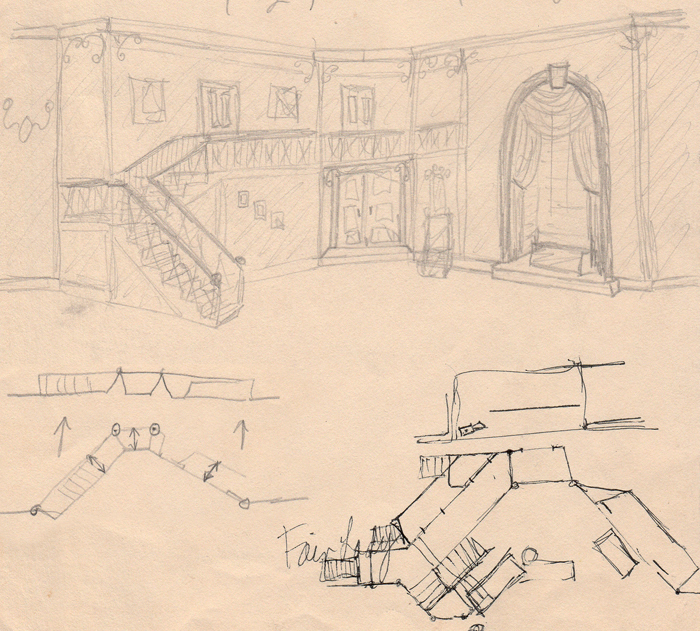 Sketches of the set, foto of actual built set below. 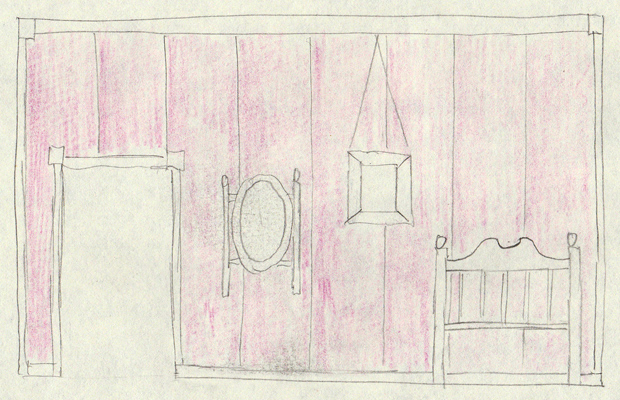 We stenciled the wallpaper pattern. 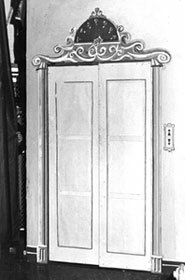 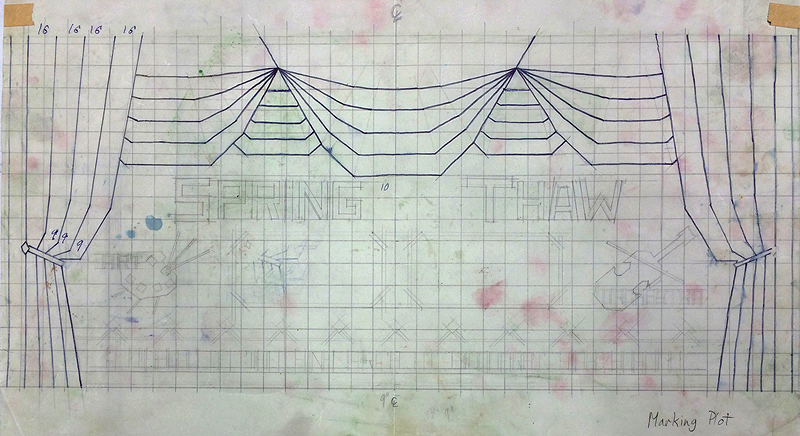 The panels in the elevator doors were cut out and covered with tracing paper. 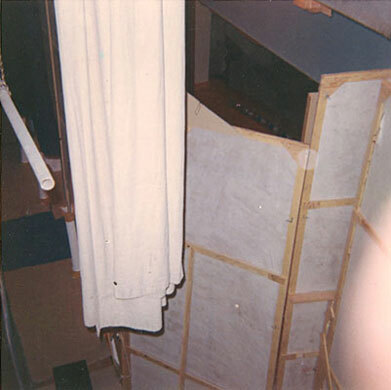 We rigged a system to raise a dark curtain behind that so the light coming through would rise up as if the elevator was ascending to that floor. 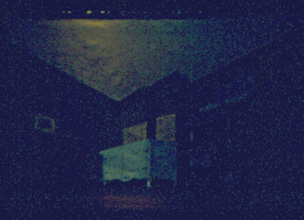 The effect worked great. 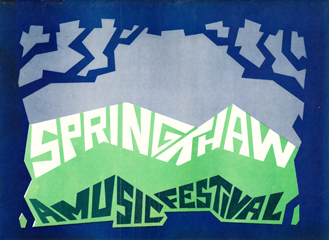 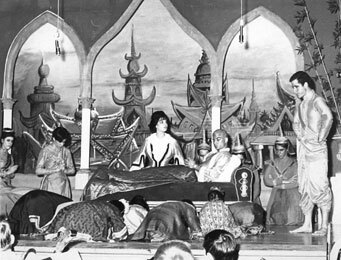 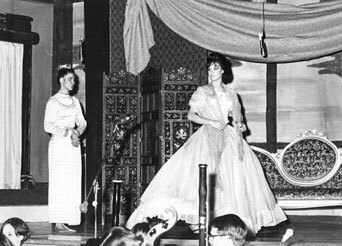 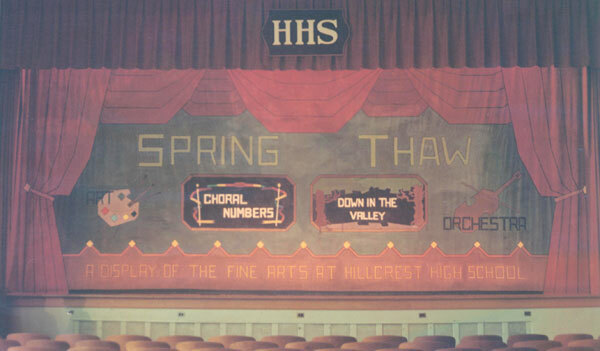 The previous year, the art and music programs spent too much money on The King and I so the administration wanted a spring musical that would be cheap to produce, hence Spring Thaw, an evening of a one-act musical, Down in the Valley, and choral and symphony performances. 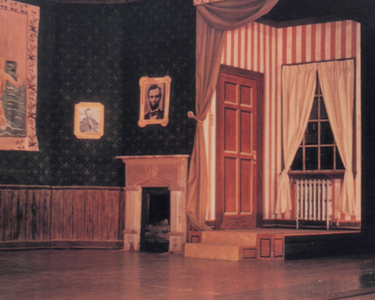 The show curtain that was seen as the audience entered, during the overture, and between acts. 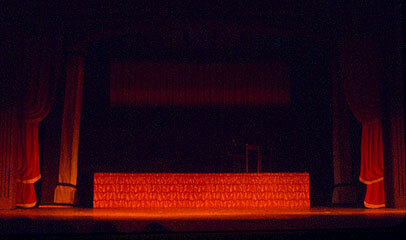 Backdrop for the choral numbers. 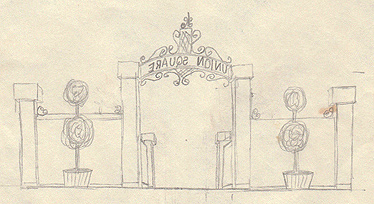 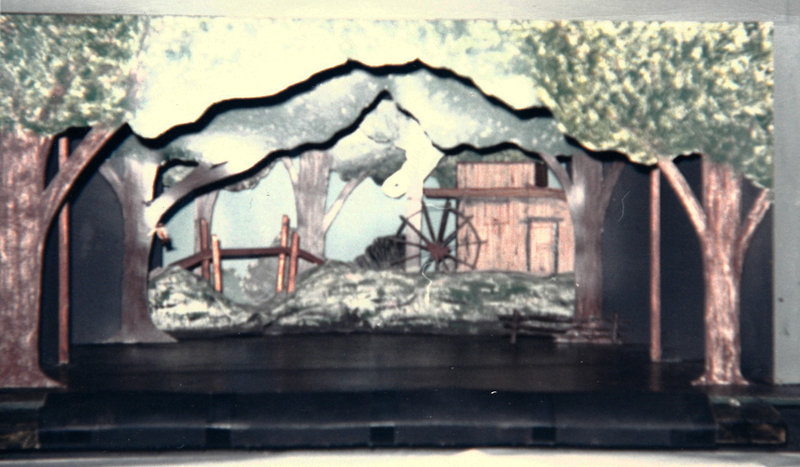 False proscenium arch to frame the musical Down in the Valley. 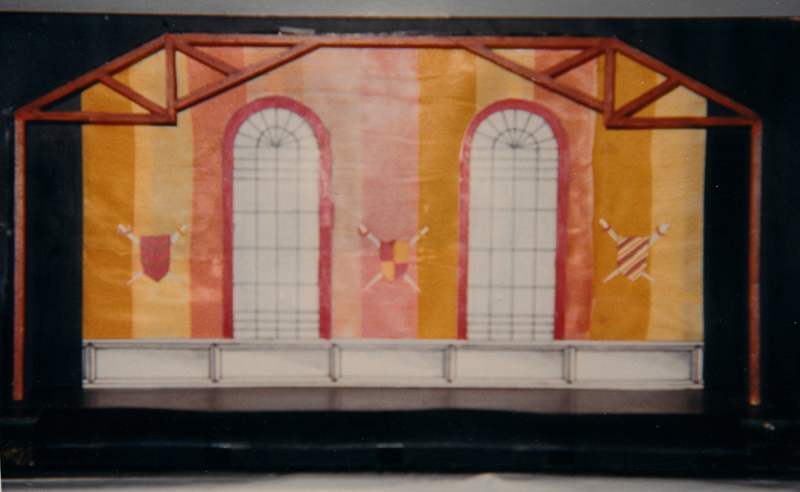 The backdrop was a series of painted canvas stage flats. 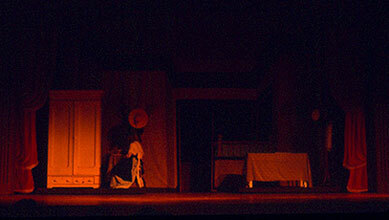 Fotos from the show. 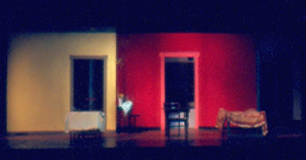 Each scene was represented by a different type of window. 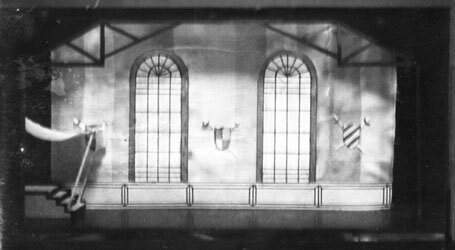 Top left: the house window was on a track and glided in from the wings. 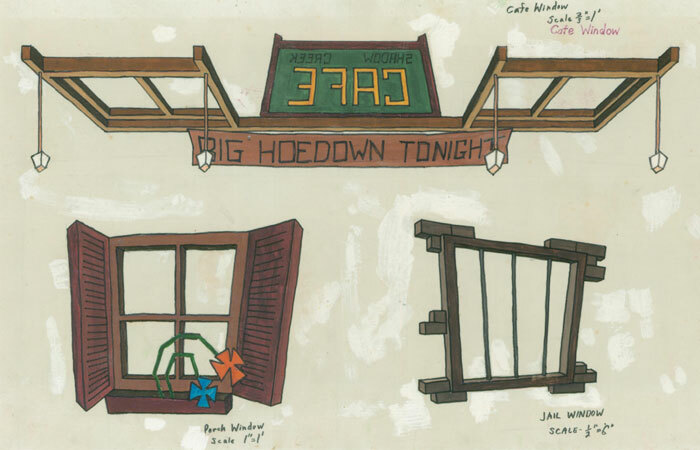 Bottom right: the Cafe Hoedown skylight window flew in from above. 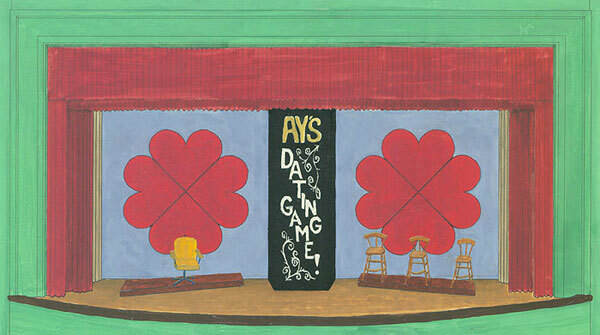 The word Cafe is backwards to convey that is the sign and we are on the back side, or inside the cafe, of the sign. 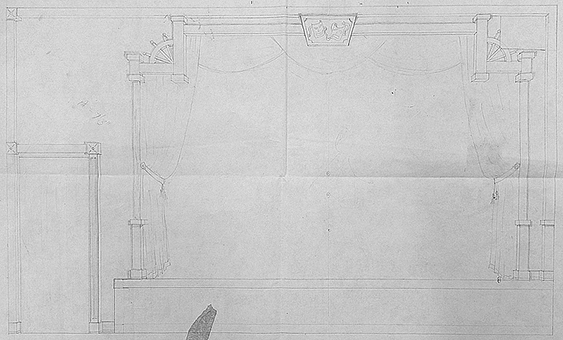 Below left: The design and construction team. 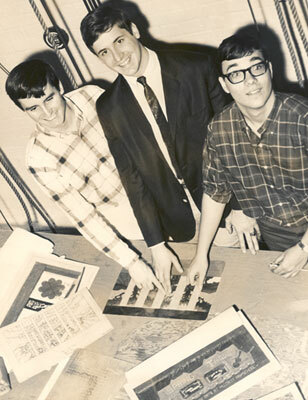 Laird McDonald, Watson, and Jeff Wincek. 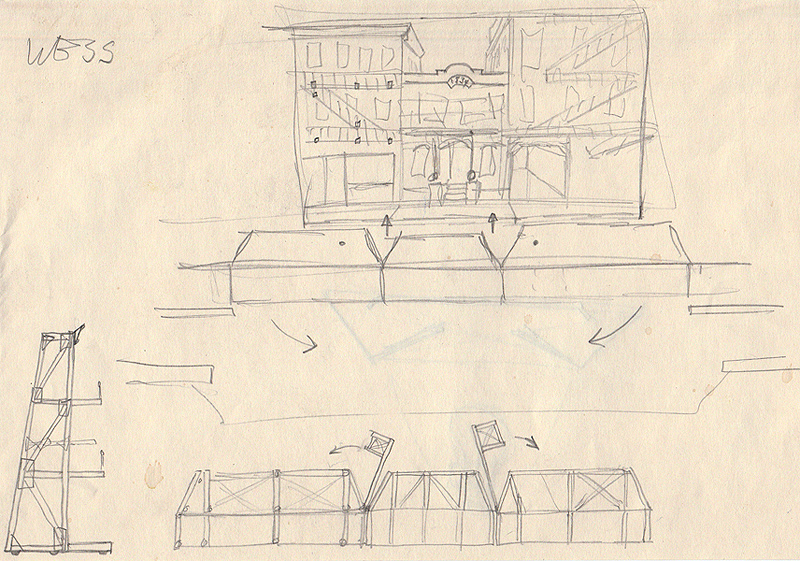 Jeff developed the background design concept and Laird helped with the implementation and construction. 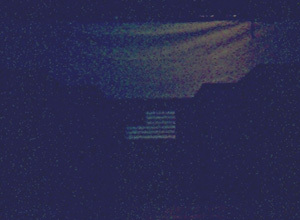 We are pointing to the rendering of the backdrop (seen above in fotos). 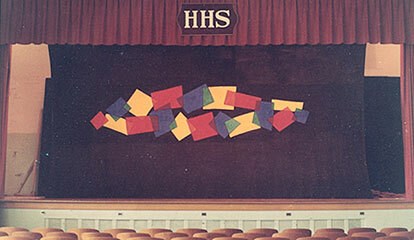 Jeff created the concept of the vertical panels for the backdrop. 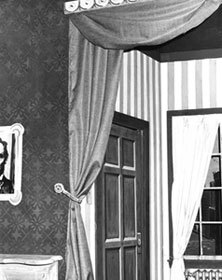 I don't think I ever gave him the credit he deserved. 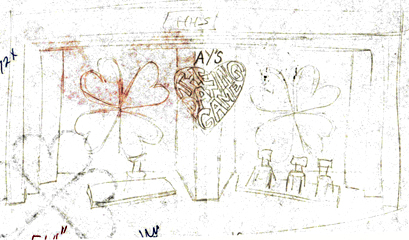 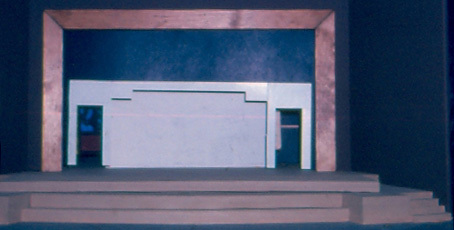 To the lower right is a rendering of the show curtain. 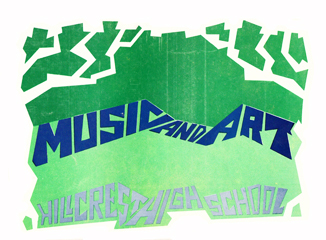 Below right: the front and back of the program cover. 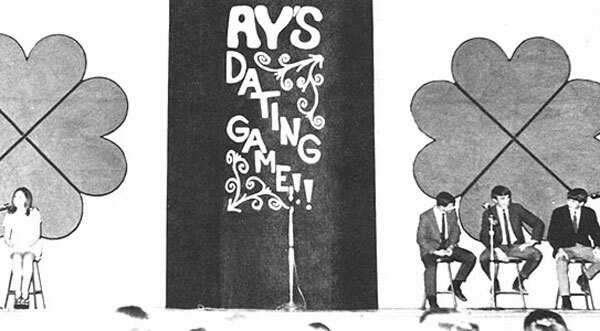 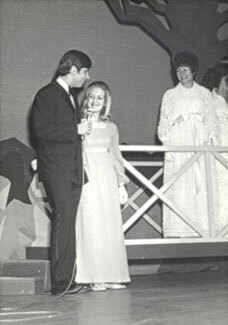 The stage set for Allied Youth's version of the Dating Game, Febuary 9, 1968. 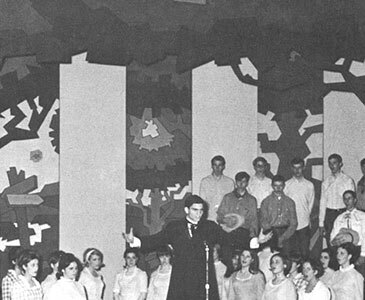 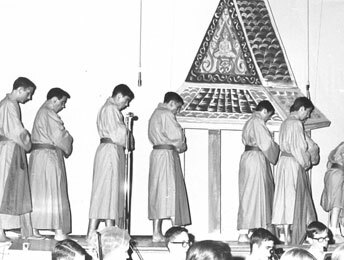 Bobby Darrow was President of Allied Youth. 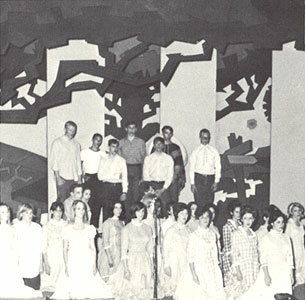 The black flats in the middle jutted out far enough so the contestants couldn't see their potential dates. 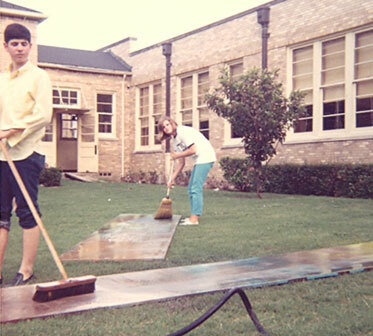 The Art Service Club was responsible for painting all the spirit posters for hanging around the school and for the pep assemblies. 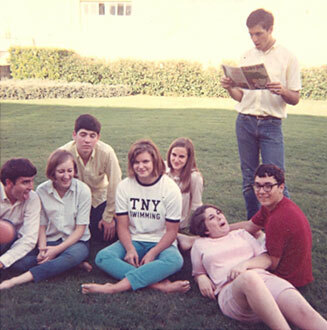 A few of the people: Betsy Brown, Barbara Smith, Laird MacDonald, Becky Kennedy, Jeff Wincek, Glenn Normile, Larry, Cathy Selman, Holly Poole. 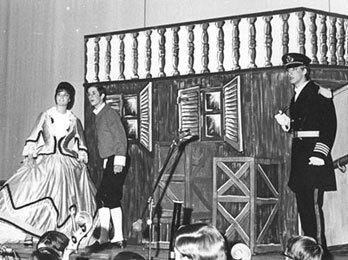 Preston Hollow Presbyterian Church had an active performing arts group. 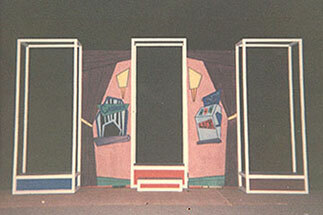 The set for this show consisted of 5 structures that were rotated and rearranged to make a variety of settings. 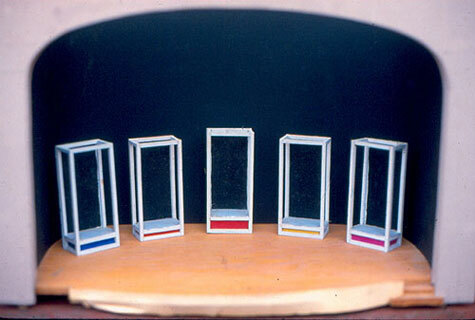 The back of each 'box' was painted black so it looked like just a framework in front of the black backdrop. 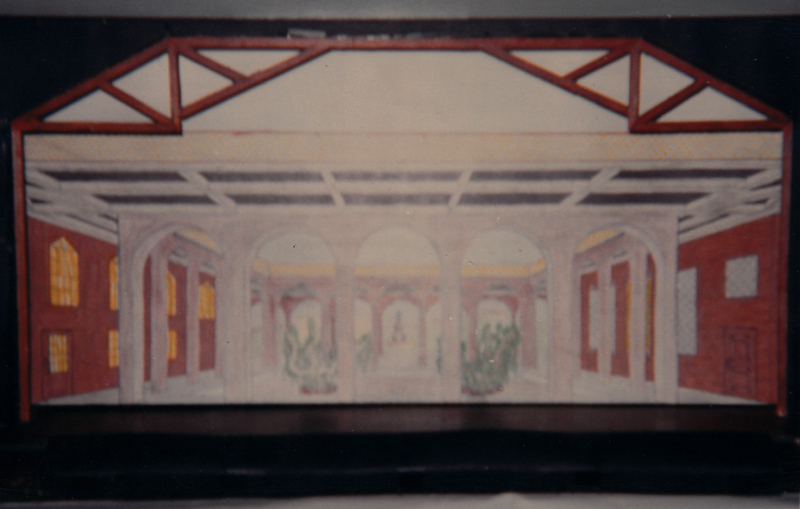 On the back side were painted scenes that were exposed when the box was rotated. 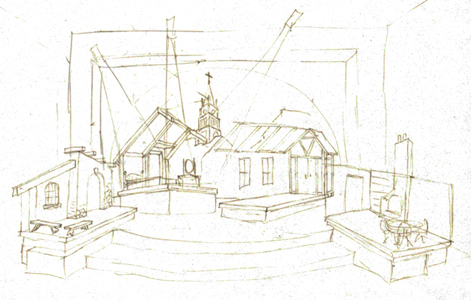 The final scene had the cast attach pieces to the boxes to build a church. 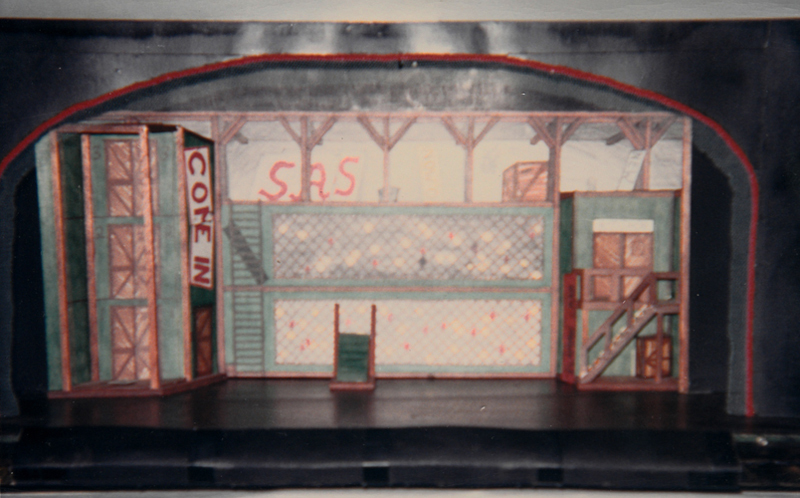 Above: the scale model of the stage and the set pieces. 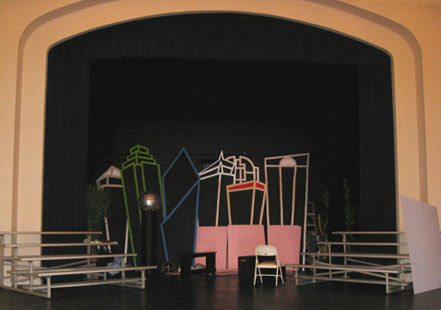 Below: shots taken during rehearsal, the backdrop has yet to be painted black. 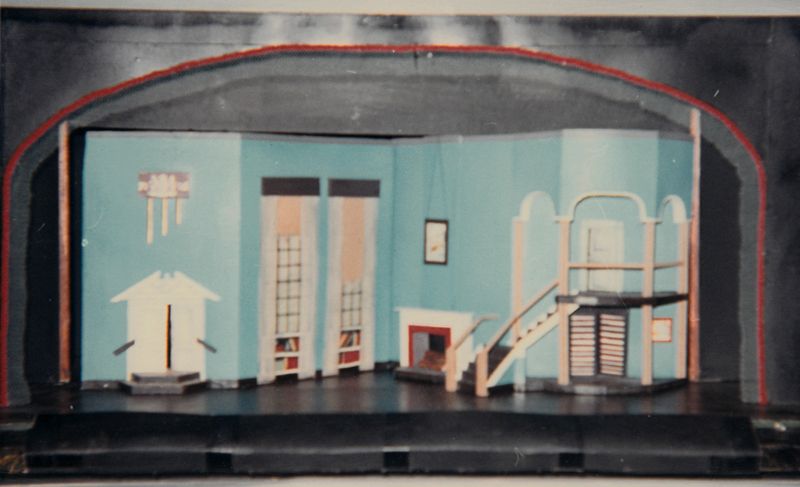 In 2010, 44 years later, my niece built a model and designed a set for the same stage. 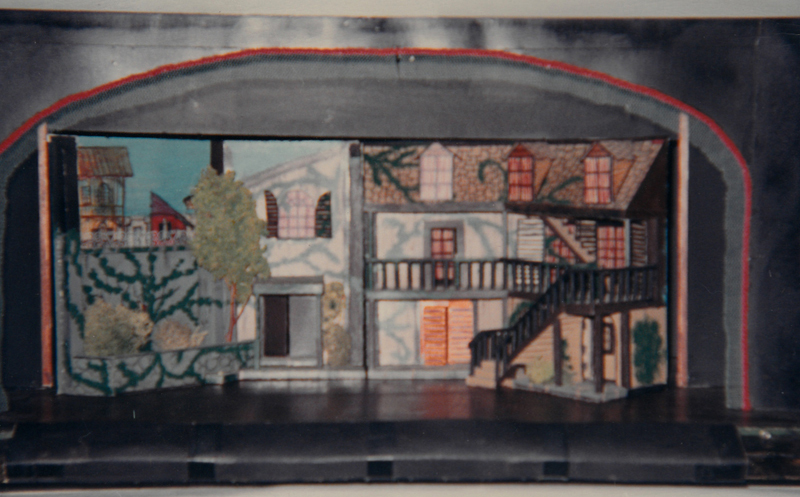 Below is a photo of the set she designed for a contemporary version of Godspell. 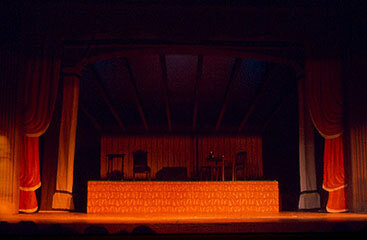 She had no idea that I had designed sets for that stage. 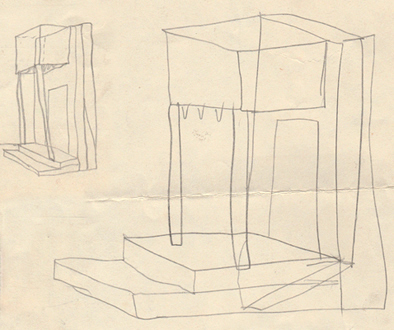 Notice the similarities in the set pieces. 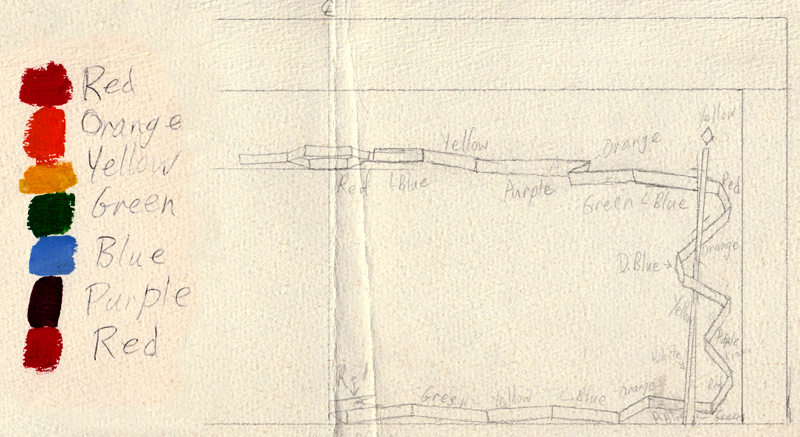 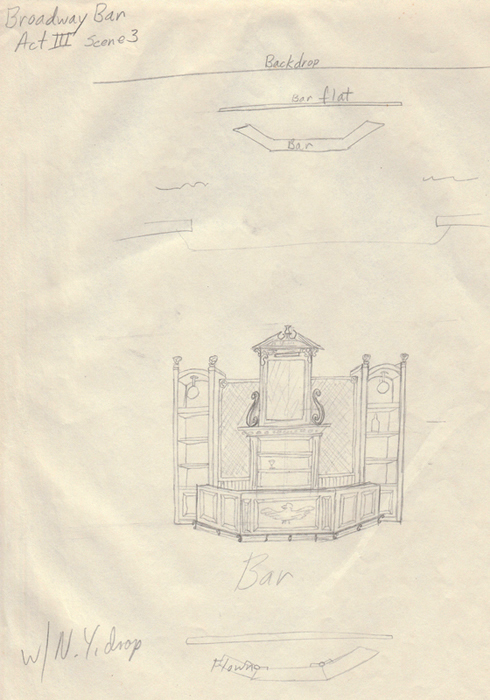 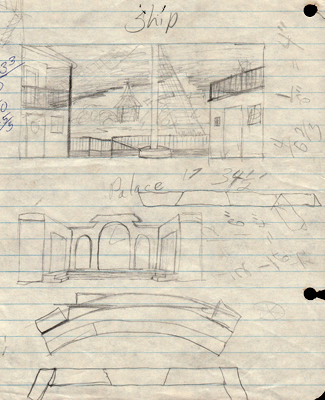 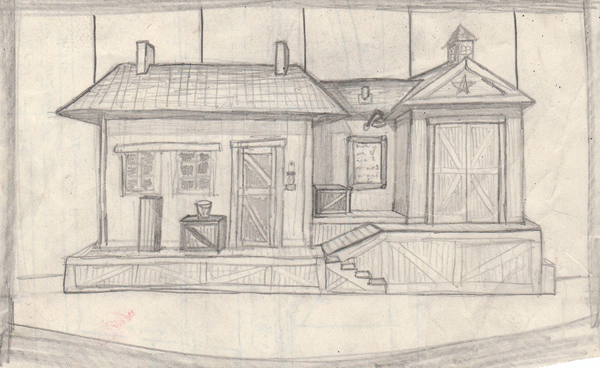 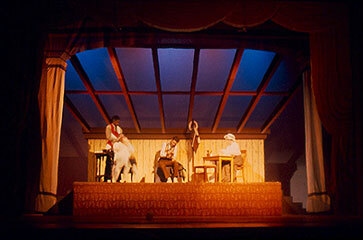 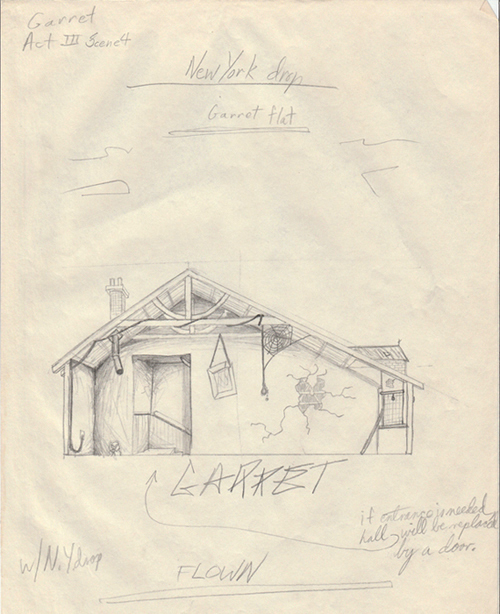 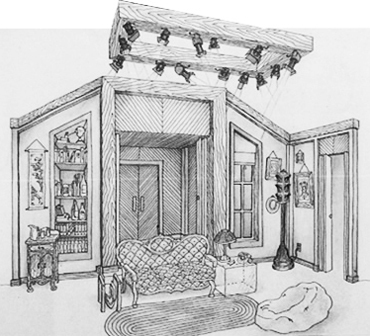 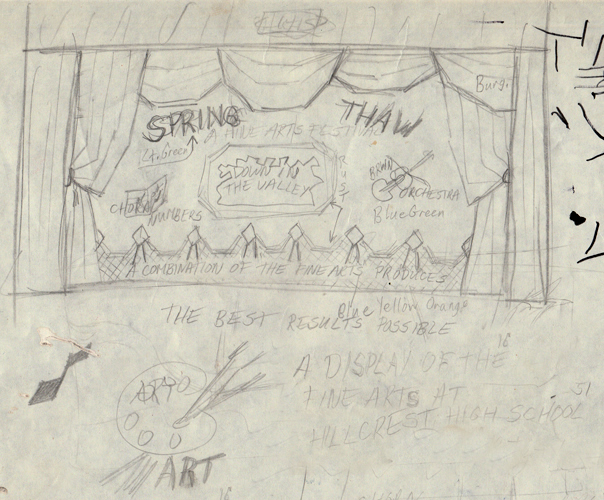 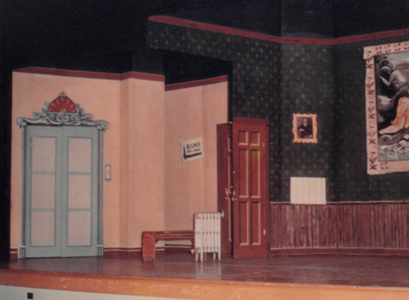 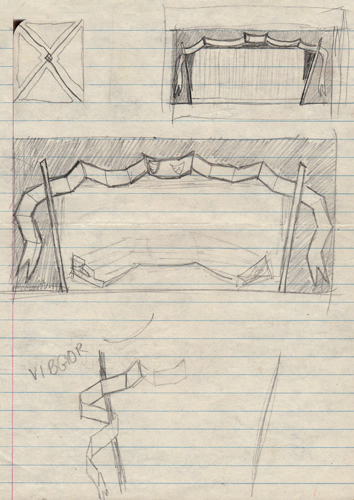 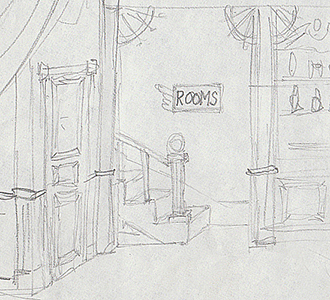 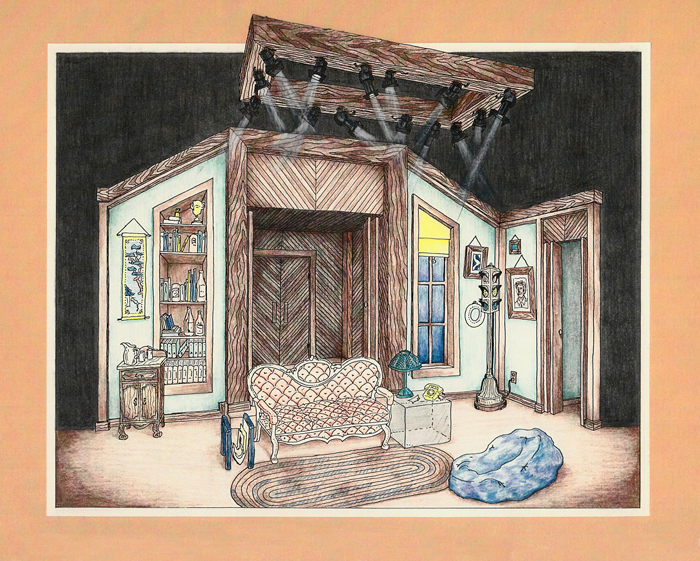 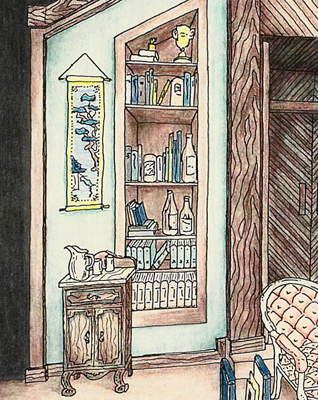 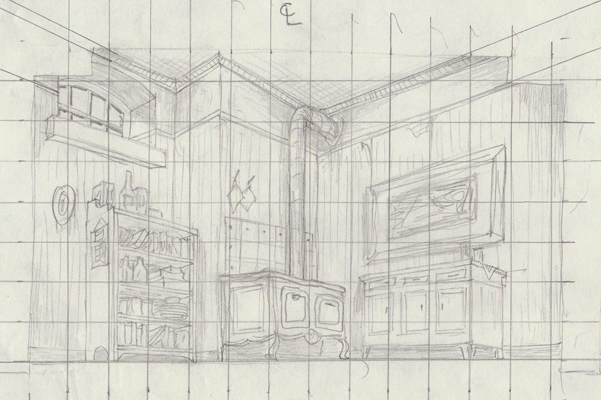 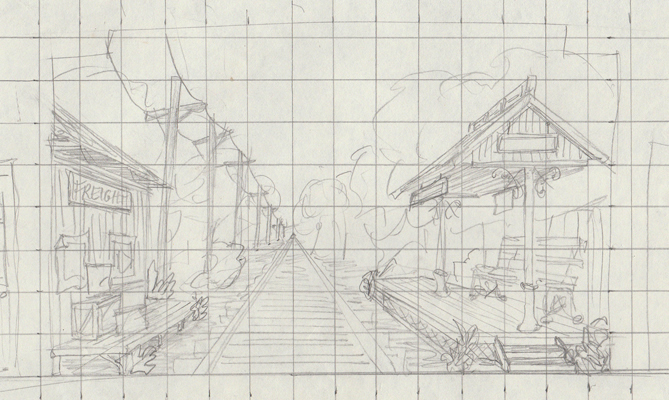 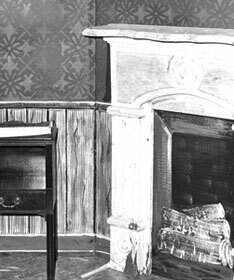 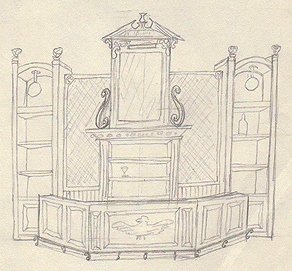 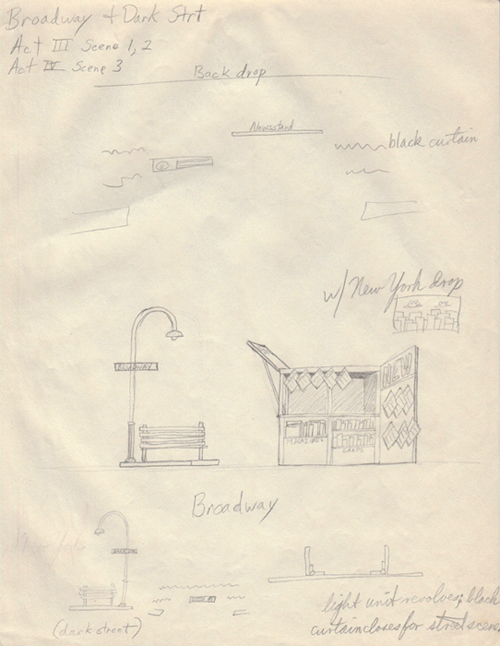 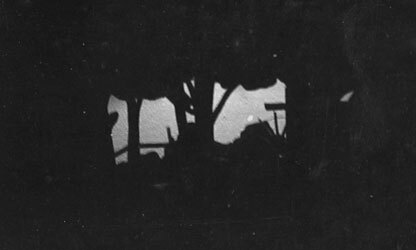 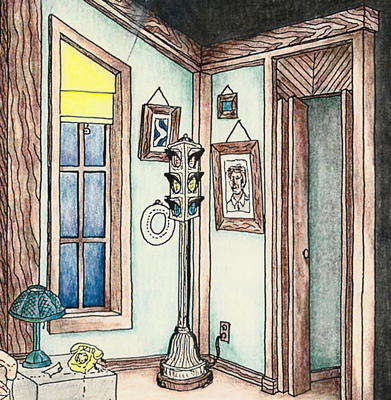 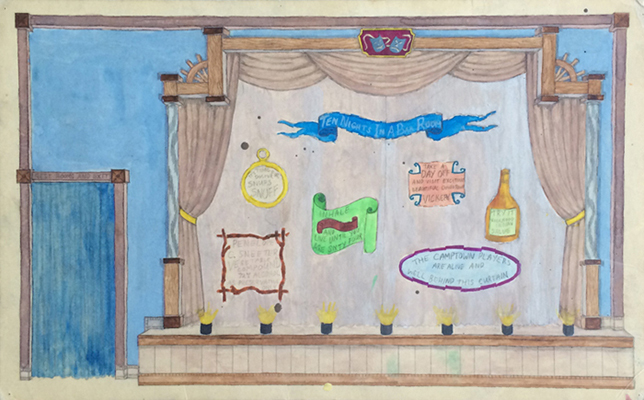 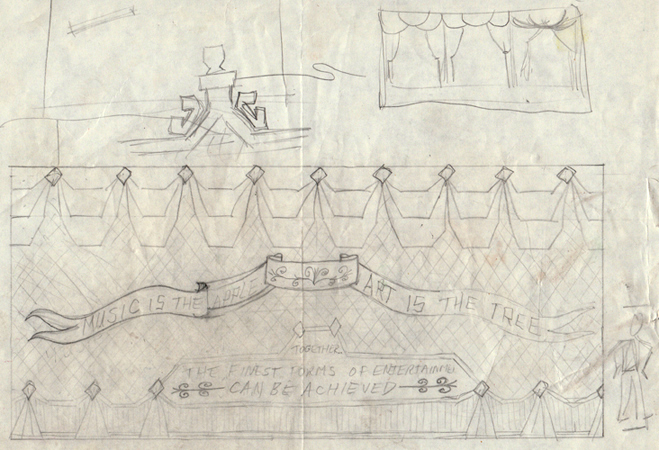 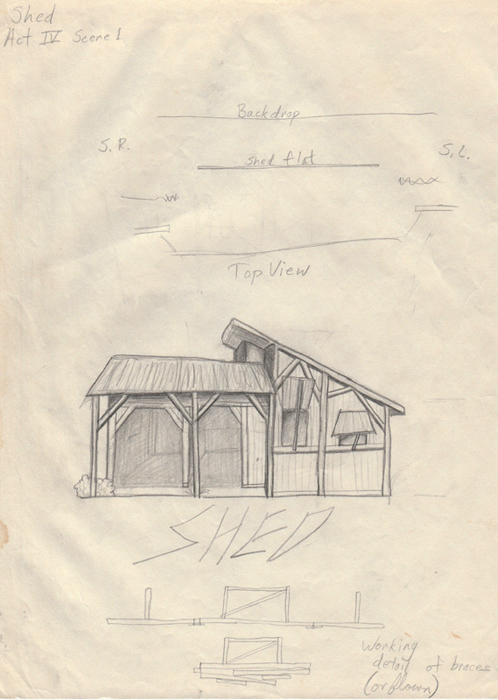 During the summer before leaving for college, I designed the ttheater and stage set for the melodrama, The Drunkard. 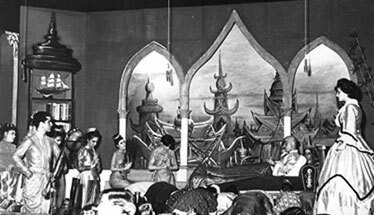 It was in a strip shopping center at Northwest Highway between Marsh Lane and Webb Chapel, in Dallas. 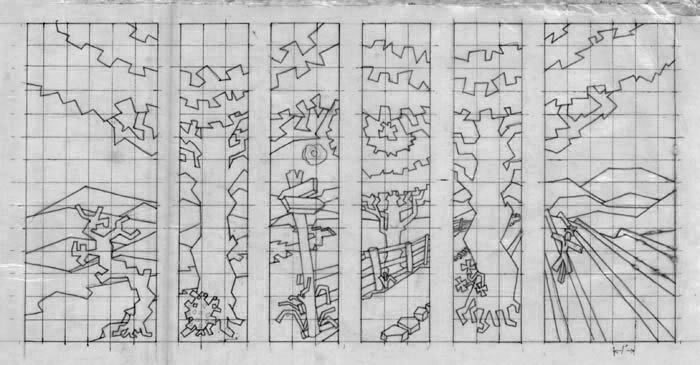 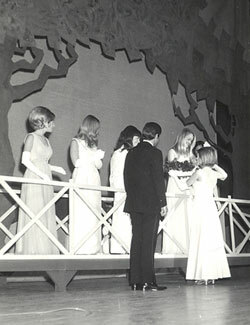 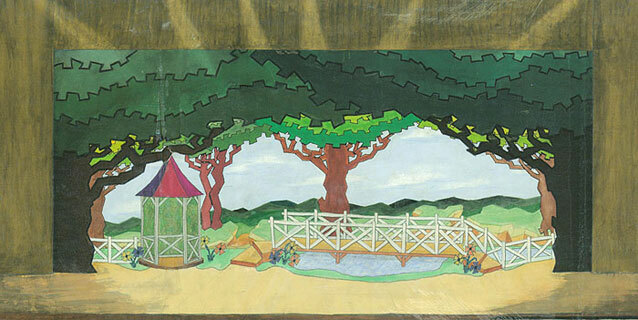 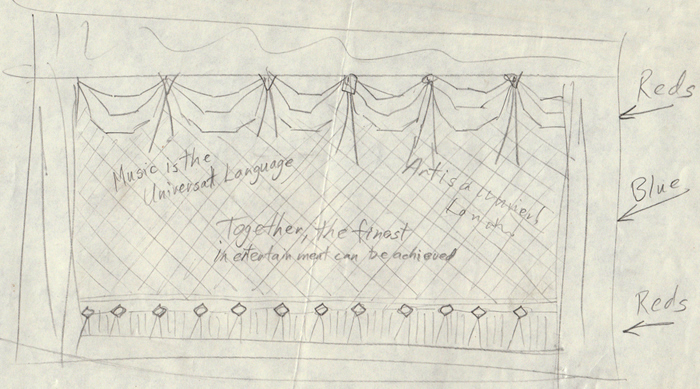 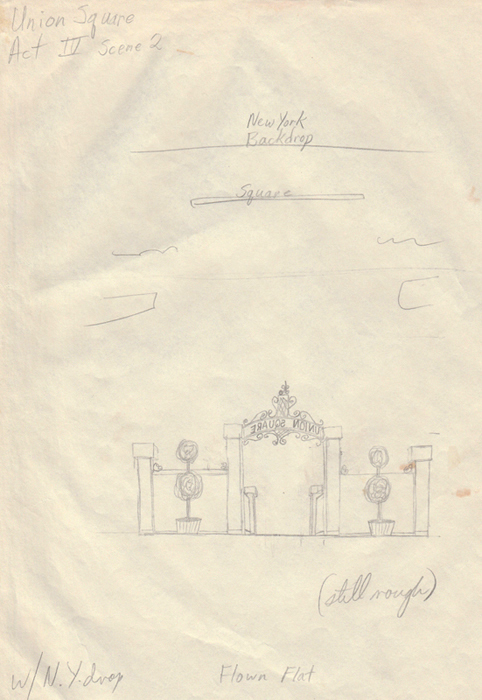 For the presentation ceremony of the UT Sweetheart finalists and coronation, spring 1970, I designed a set resembling a park/garden with a frame arch of abstract trees and a bridge to elevate the contestants in the lineup. 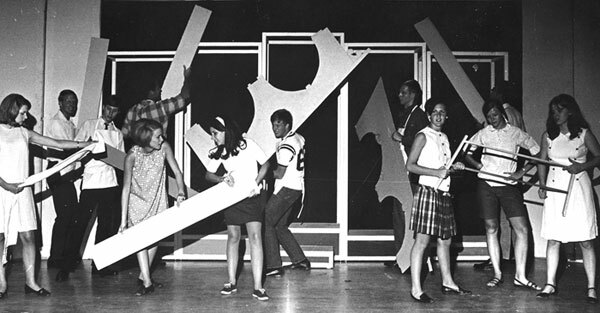 This play was written by Tom White in 1973. 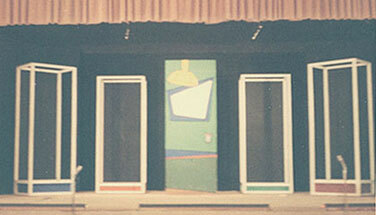 The play revolves around a main character in a wheelchair who can communicate only through pressing buttons to operate an old stoplight - colors representing yes, no, and sorta maybe. 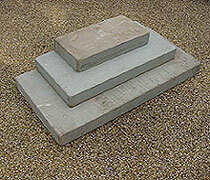 His wife and her lover are able to manipulate him some because of his need to rely on them and the stoplight. 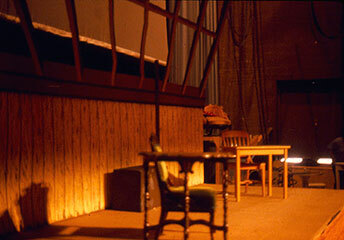 The play was presented at the Direct Theatre in New York City on March 5, 1976. 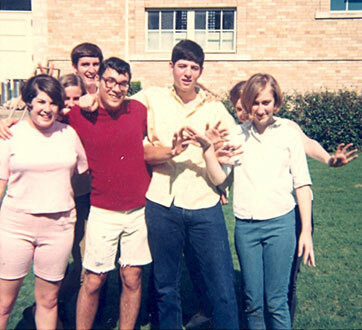 Tom, his family, and some of his friends - Ed Baxter, myself, Toni White, and April Rapier - attended the premiere. 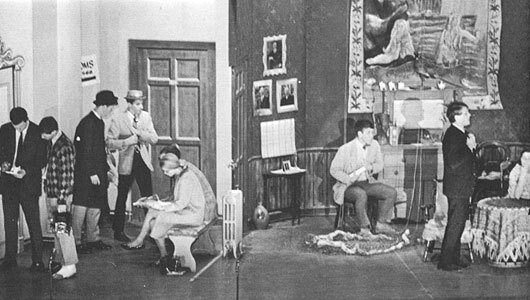 This was one of Tom's first plays to be produced. 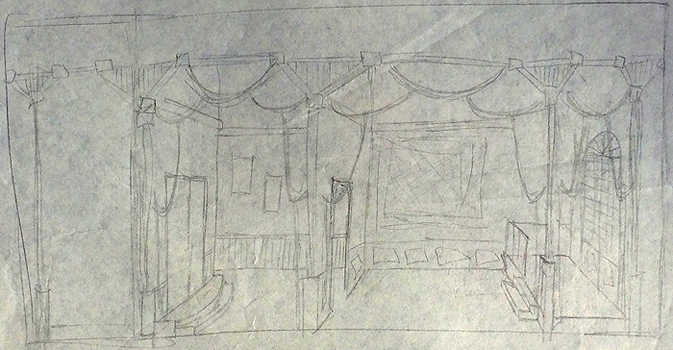 A publisher bought the rights and needed a set design to include in the published script. 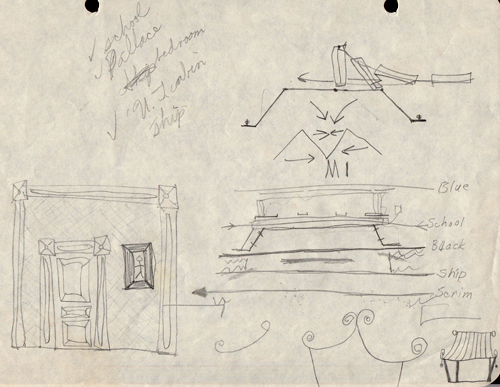 Tom asked me to prepare a rendering and plan - he knew that I had come to the University of Texas majoring in set design. 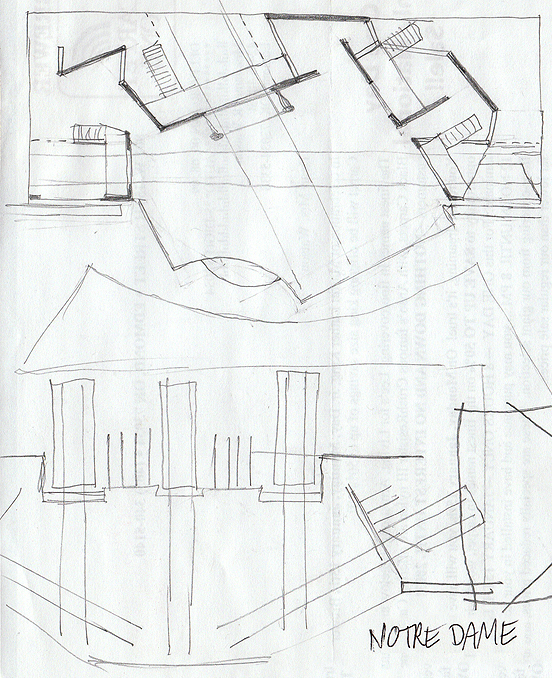 Above: Rendering. 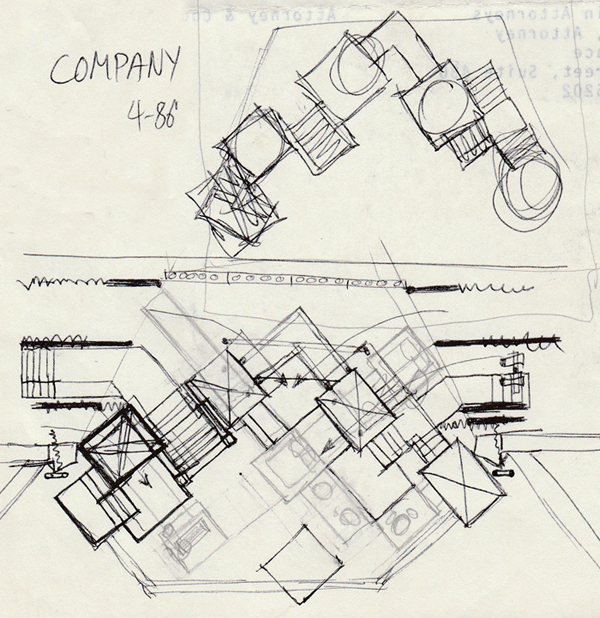 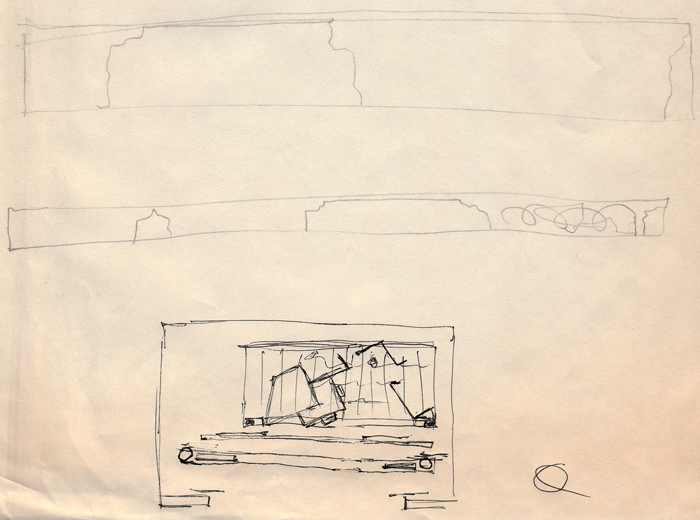 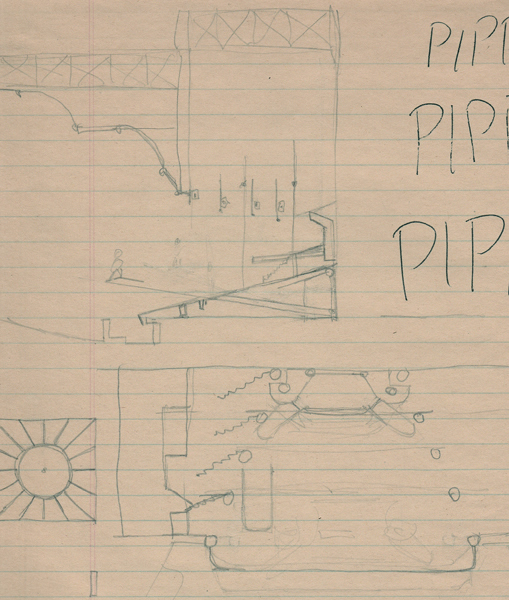 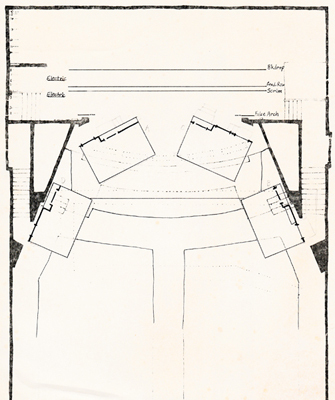 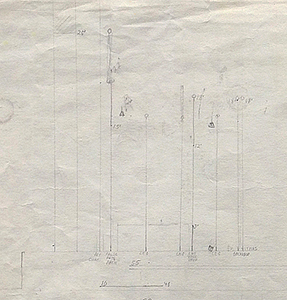 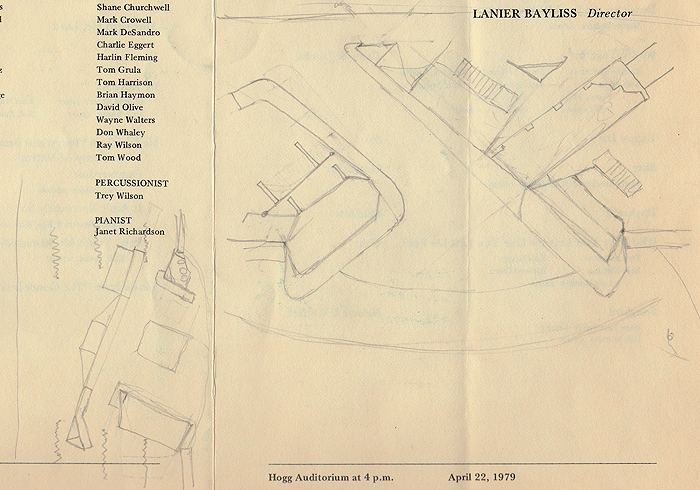 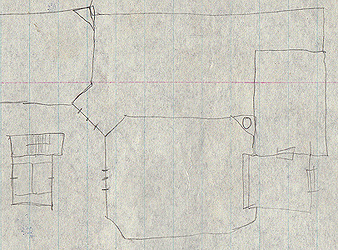 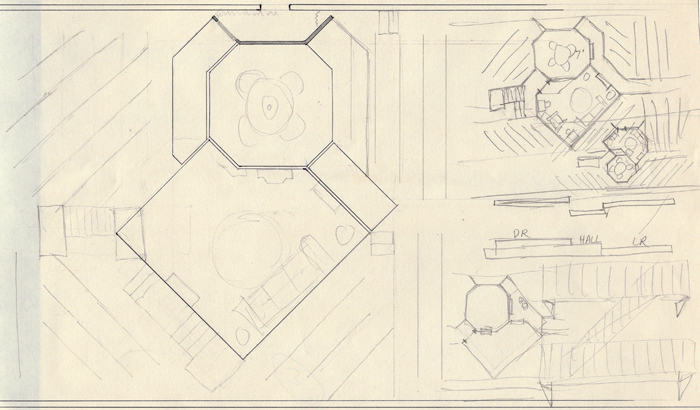 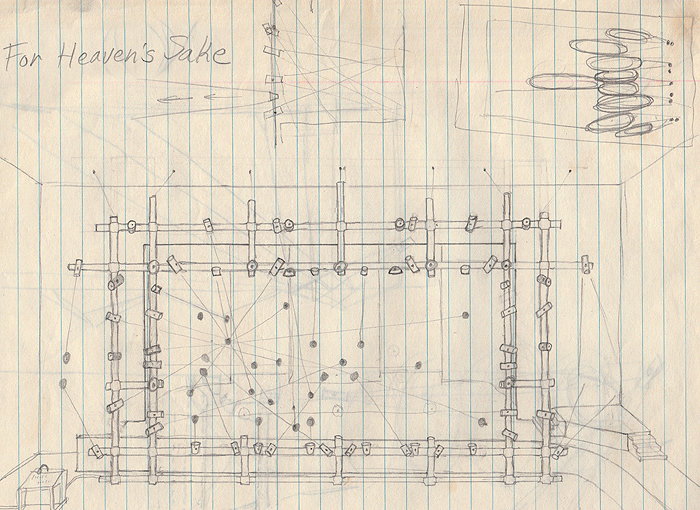 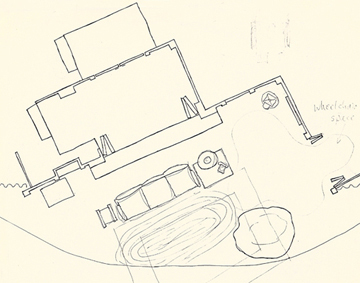 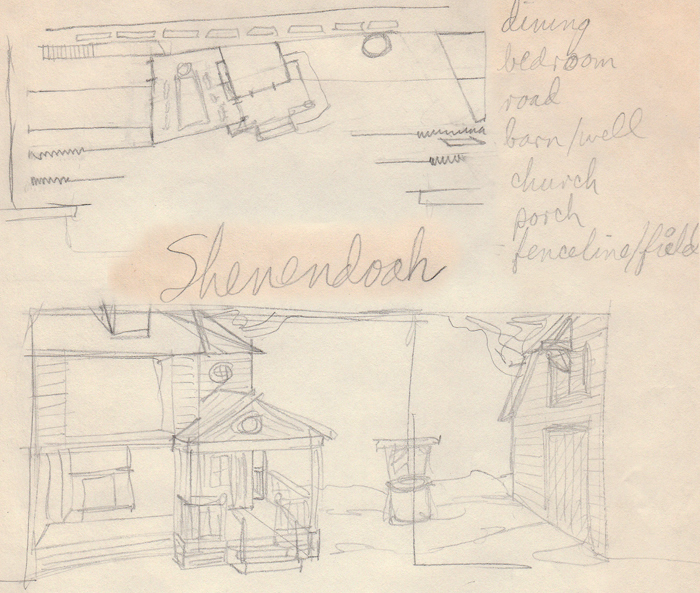 Below: Sketch and Floor plan. 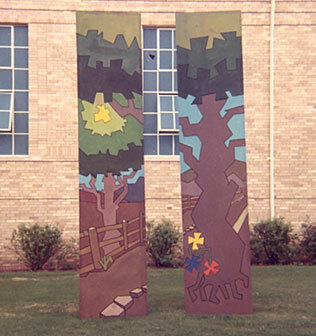 I had read about the Arts Magnet High School in downtown Dallas. 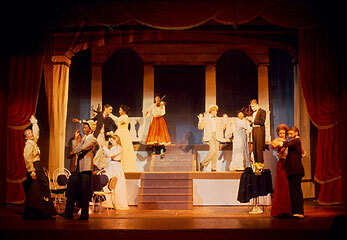 Full name: Booker T. Washington High School for the Visual and Performing Arts. 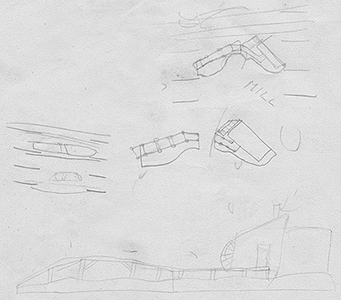 I called the school and, after some connections and discussions, I was asked to help out in the Design area as a Teaching Assistant. 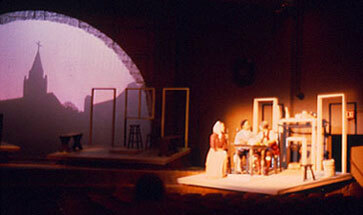 I was still in graduate school and thought this would be a good gig while in school. 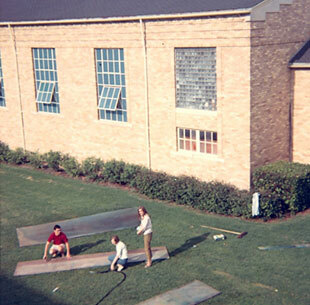 I was hired full-time for the next fall, 1979 and taught for two years, 1979-81. 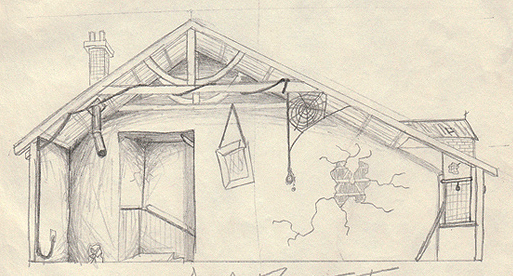 I was hired by two departments - Art and Theater. 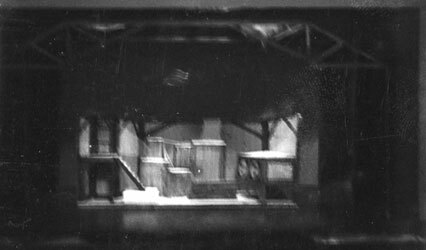 I taught art classes, Basic Design and Drawing, in the morning and theater classes, Prop Design and Set Design, in the afternoon. 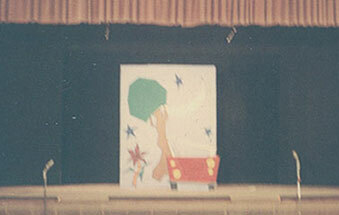 It was fun because I got to know students in 2 of the school's 4 departments (the others were Dance and Music). 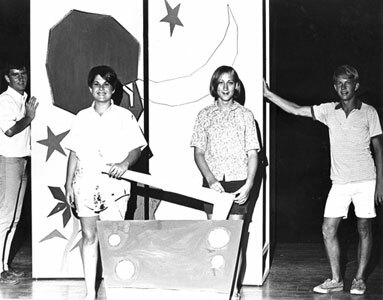 I also helped out the Stagecraft teacher, Roger Richards. 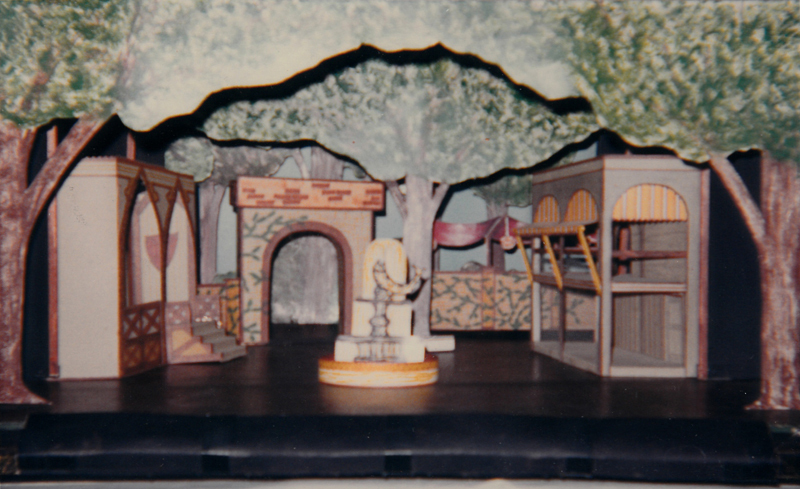 We worked together in that I and my students designed the sets and he and his students built the sets. 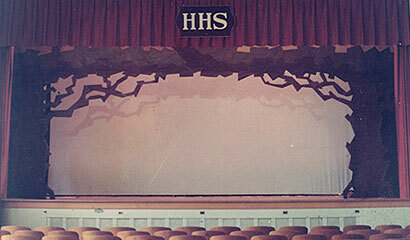 I designed stage sets in high school and college and it was fun to get back in the shop and create the magic that happens on the stage of live theater. 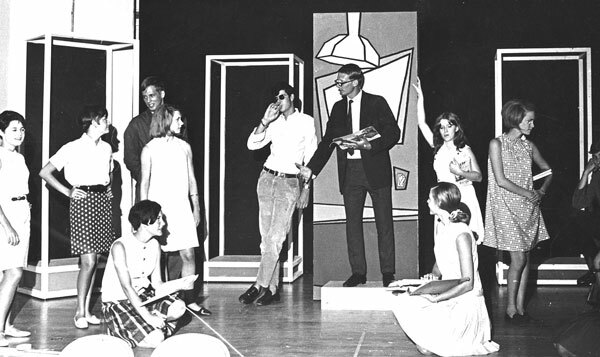 I loved teaching high school. 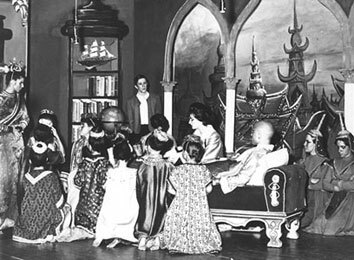 It was very satisfying to serve as a role model for these young kids. 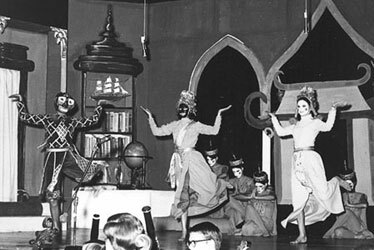 This classic drama by Arthur Miller is the story of the Salem witch trials makes a statement about the Communist witch hunt of the 1950s. 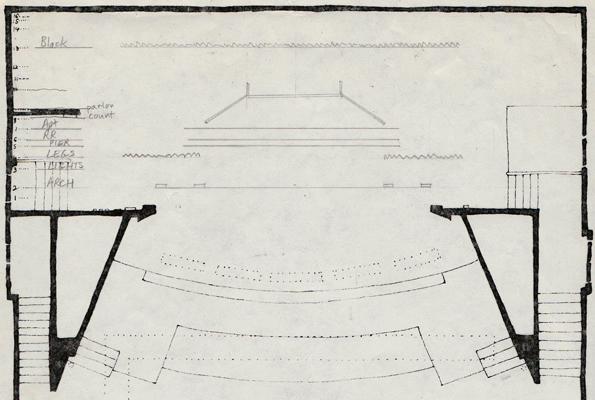 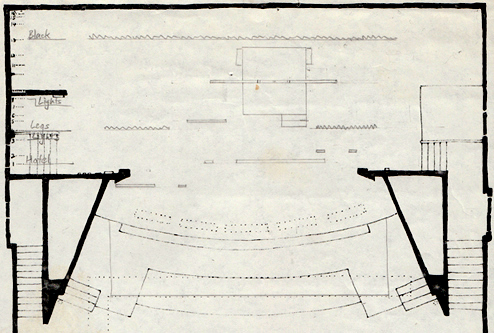 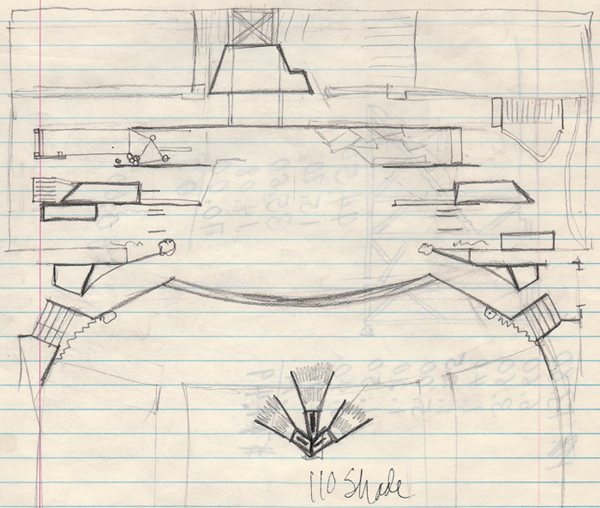 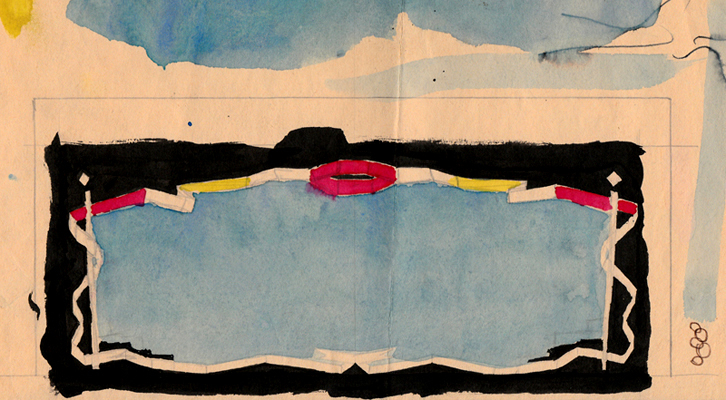 The floating platforms formed a semicircle with the end tow platforms jutting out into the theater seats. 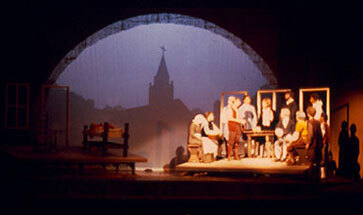 The arch theme was repeated in the proscenium arch that framed a silhouette of a town with the church steeple dominating the scene. 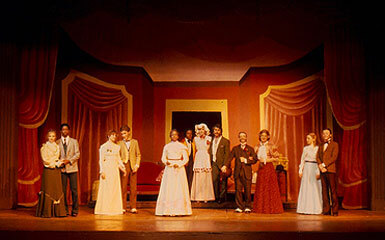 The play that was adapted into the Broadway musical Hello Dolly.